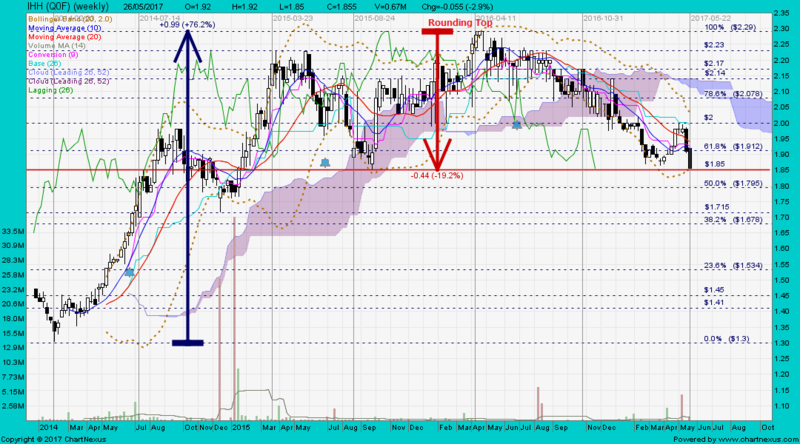 Innovalues closed with a black marubozu @ S$0.815 (-0.035, -4.1%) with 4.53m shares done on 4 Oct 2016. 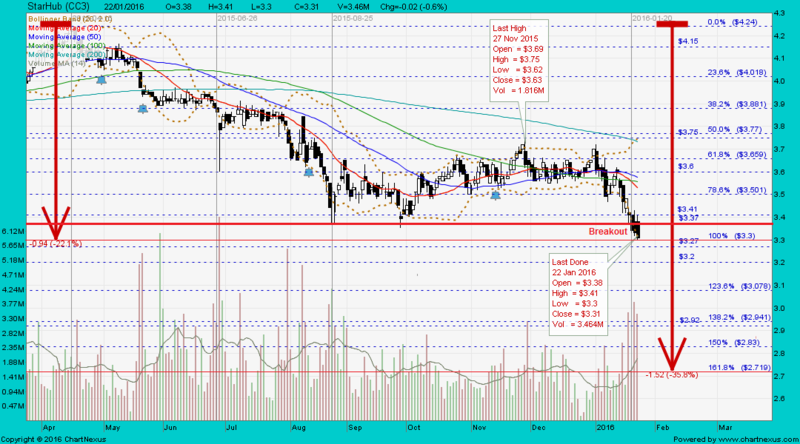 Immediate support @ S$0.73, immediate resistance @ S$0.845. Sino Grandness closed with a doji @ S$0.355 (-0.005, -1.4%) with 720,000 shares done on 20 Oct 2016. 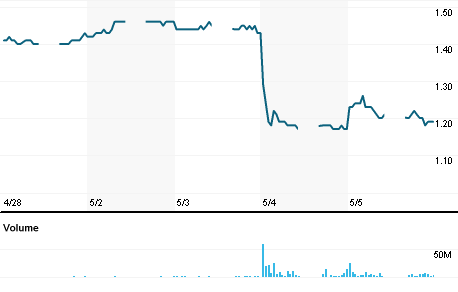 Sino Grandness closed with a hanging man @ S$0.43 (-0.01, -2.3%) with 2.87m shares done on 24 Feb 2016 at 1445 hrs. 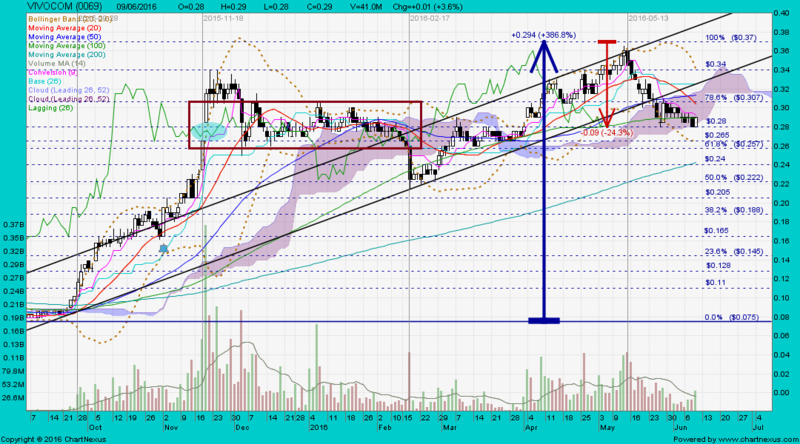 **Immediate support @ S$0.325, immediate resistance @ S$0.395. Bro can you just concentrate on Malaysian stocks? 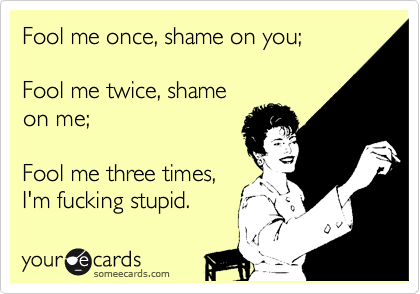 Anyway, please TA UOADEV for me. Yesterday naik kaw kaw! 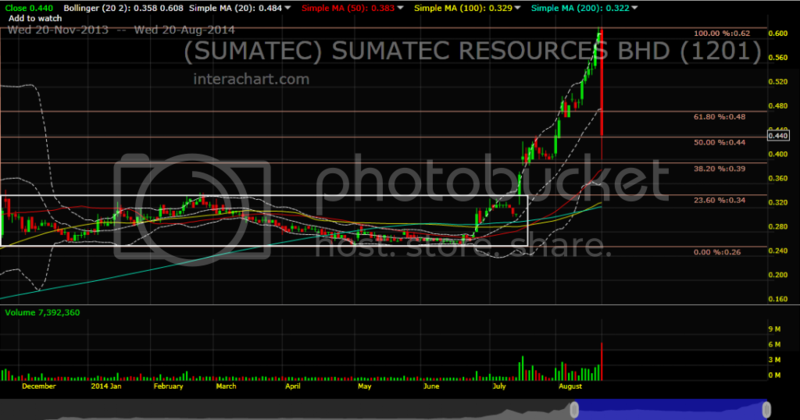 Sumatec closed unchanged @ RM0.07 with 6.64 million shares done on 16 Mar 2017. JF Apex Research said Sumatec’s associate Semua Shipping Sdn Bhd has received a legal notice from Malayan Banking for allegedly defaulting on loans totalling RM121.4mil. It is learnt that the investment bank involved and the Securities Commission are looking into the report, which was made public “momentarily” a day before the company actually released its latest quarterly results. “In the meantime, it is learnt that the analyst has been relieved of duties,” said a source. 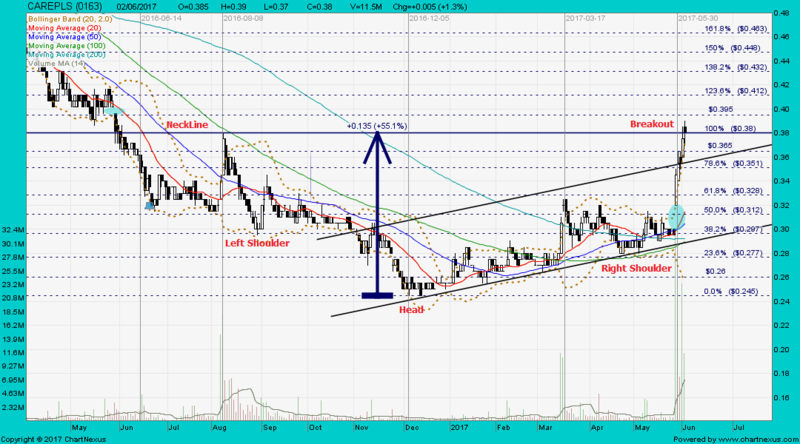 Vivocom closed with an inverted hammer @ RM0.16 (+0.005, +3.2%) with 71.5m shares done on 16 Mar 2017. 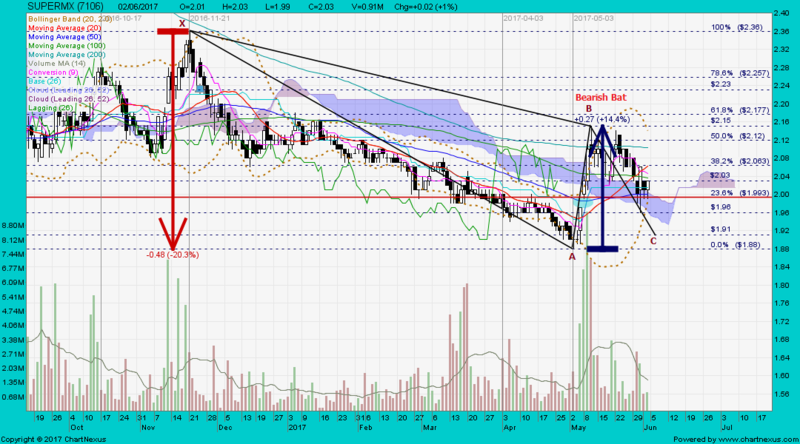 KNM closed with a doji unchanged @ RM0.30 with 9.92m shares done on 24 Mar 2017. 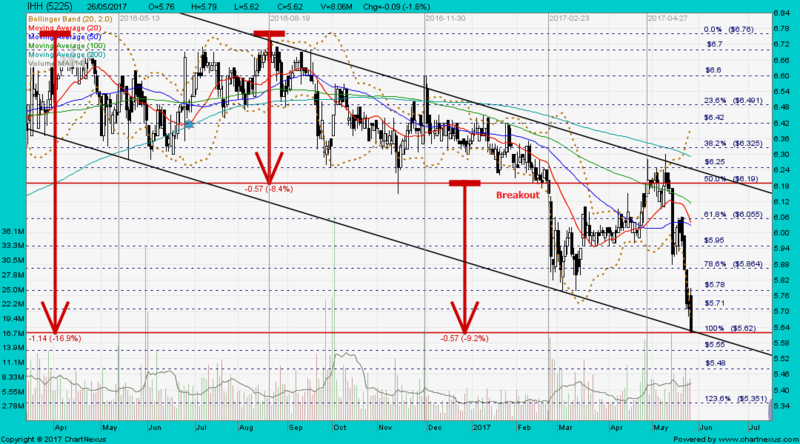 Immediate support @ RM0.285, immediate resistance @ RM0.31. 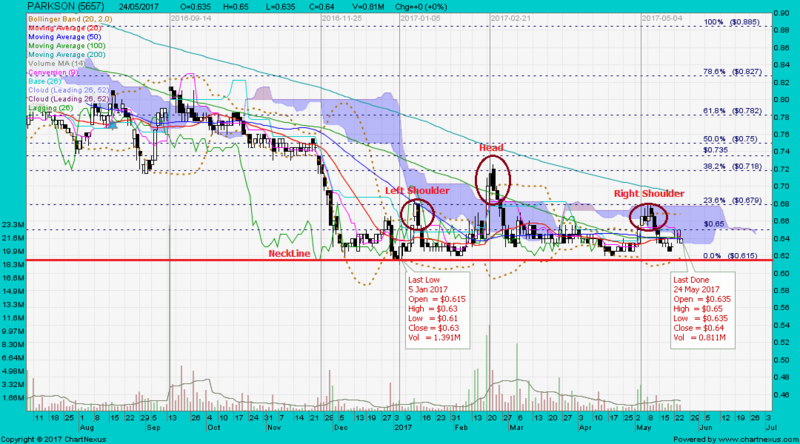 SEnergy closed with a spinning top @ RM1.85 (-0.03, -1.6%) with 15.4m shares done on 30 Mar 2017. 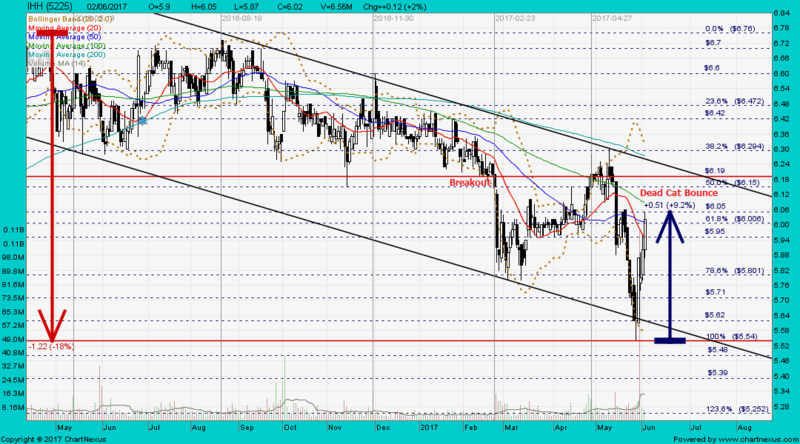 Immediate support @ RM1.83, immediate resistance @ RM1.91. 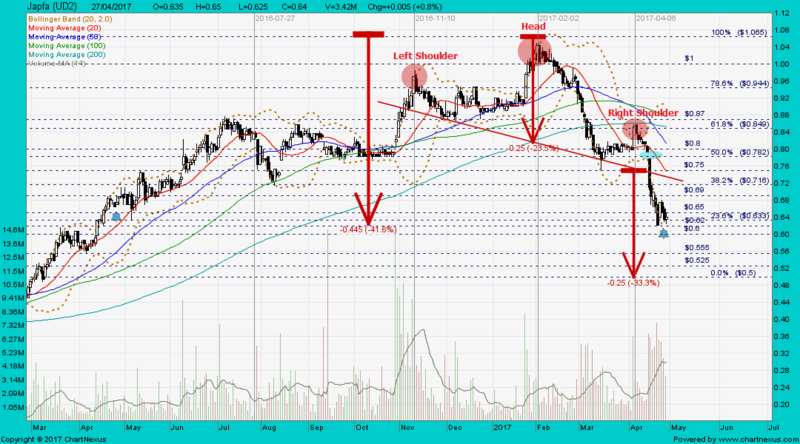 The company was previously known as Sapurakencana Petroleum Bhd. Chesapeake closed @ US$6.32 (+0.40, +6.8%) on 4 Apr 2017, up nearly 20% since March 25. 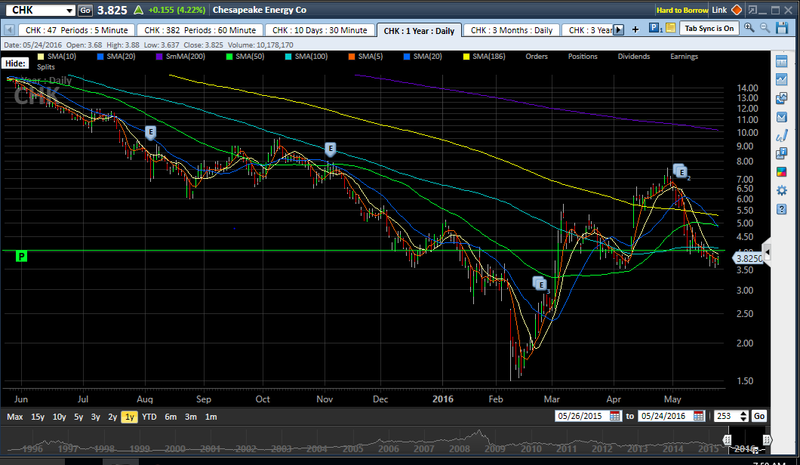 In the last 12 months, Chesapeake has gone from $14 to $1.60; from there it rose 400% to $7.50 and since has sold off 54% to the $3.54 level where there is strong support. 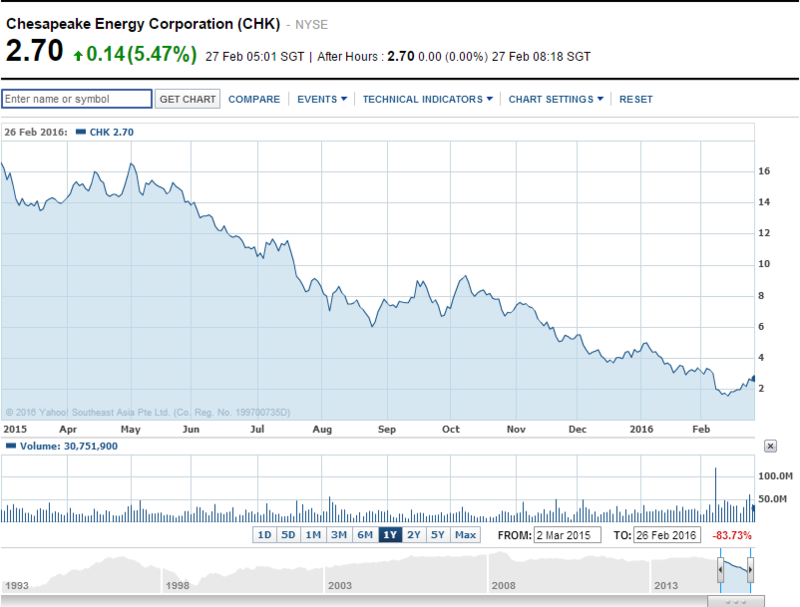 Chesapeake closed @ US$2.70 (+0.14, +5.47%) on 26 Feb 2016. Chesapeake closed @ US$19.03 (+0.70, +3.82%) on 17 Jan 2015. 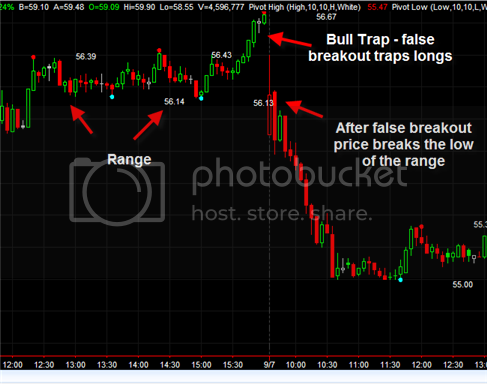 The chart showed that Chesapeake was in a strong downtrend as the prices of oil and natural gas plummeted. 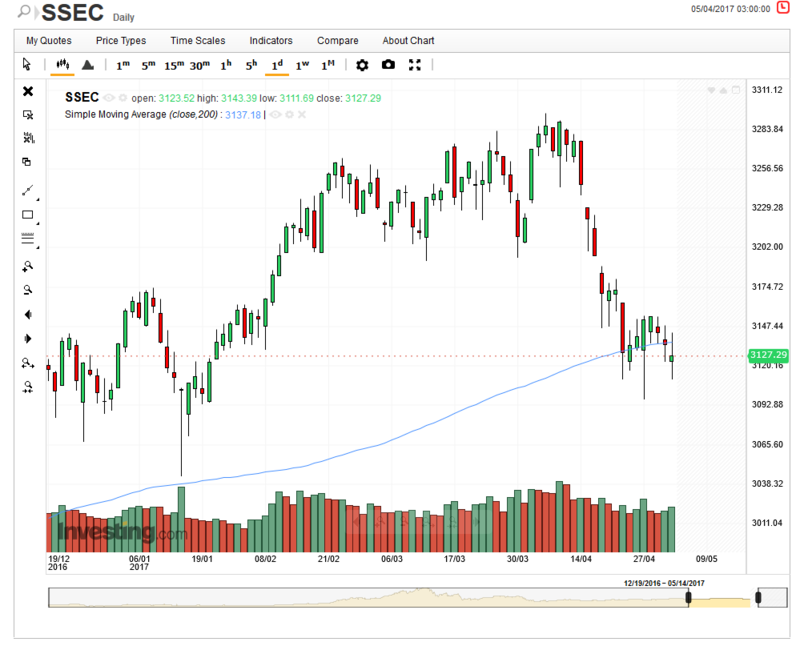 SEOUL, June 21 Korea Investment Corp (KIC) said on Monday it would invest $200 million in Chesapeake Energy Co (CHK.N) as the U.S. No.2 natural gas company was set to issue $900 million worth of convertible preferred stock. China Investment Corp (CIC) and Singapore state investor Temasek Holdings [TEM.UL] would also take stakes in Chesapeake, although the exact investment amount was not disclosed, KIC said in a statement. 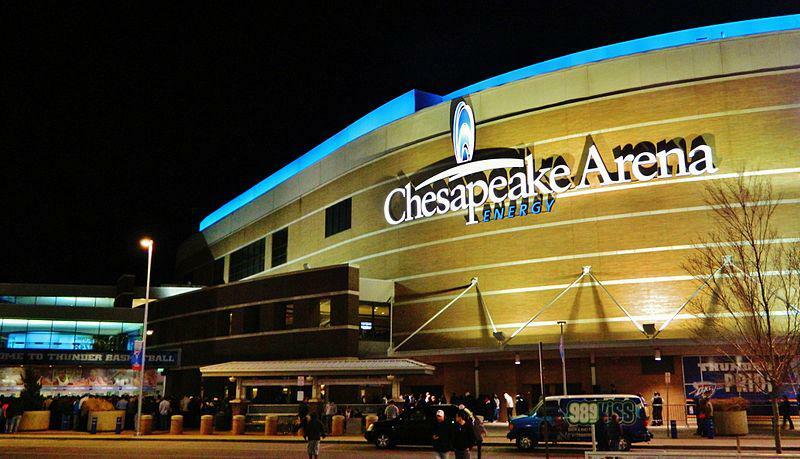 The statement said the investment would bring stable annual dividend income of 5.75 percent, and additional income if higher gas prices helped Chesapeake's share price strengthen, and KIC converted its holding into common stock at the agreed $27 per share. Chesapeake shares closed at $24.61 on Friday. "We made the investment decision because the long-term gas price outlook is bright on a global push for clean energy and expectations of less deep-sea water drilling in the Gulf of Mexico after BP's (BP.L) (BP.N) oil spill," the KIC statement said. 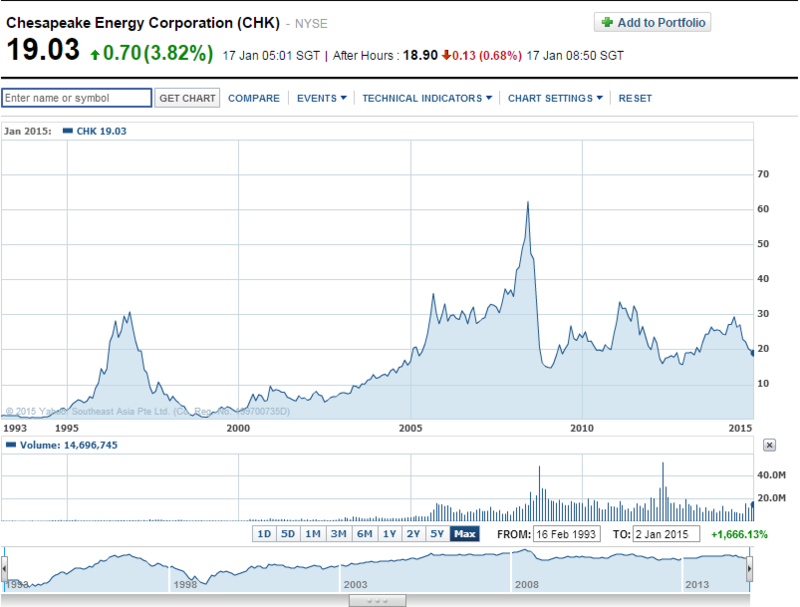 KIC, set up in 2005 to enhance sovereign wealth and help managing assets entrusted by the government and the Bank of Korea, also said in the statement that higher gas prices were projected because of relatively low gas prices against crude oil resulting from unbalanced supply and demand. A month earlier, Chesapeake had issued $1.7 billion worth of convertible preferred stock under the same conditions, with U.S. institutional investors taking $1.1 billion and Asian institutional investors the remainder, it said. 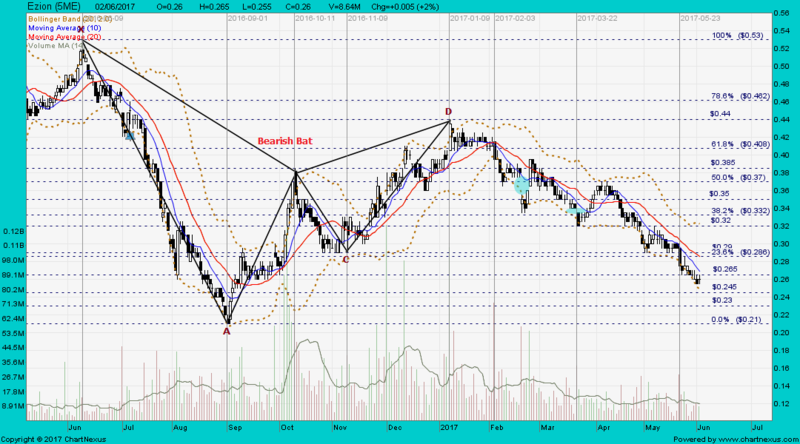 Now, we are chicken players in chicken stage with our Bursa also in chicken stage. 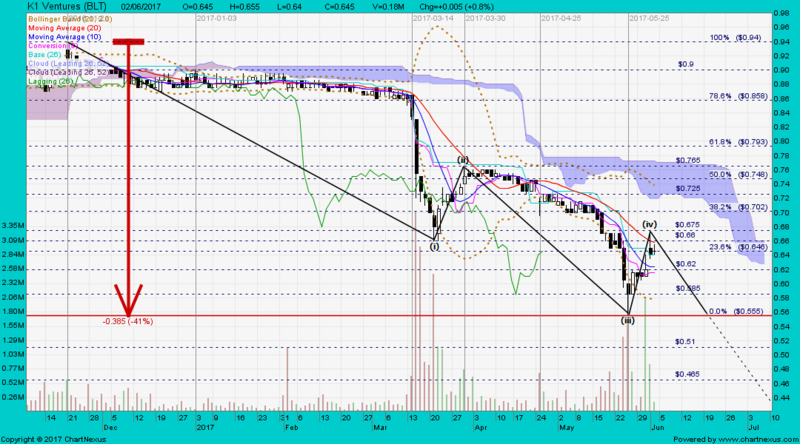 Japfa closed with a spinning top @ S$0.64 (-0.005, -0.8%) with 3.42m shares done on 27 Apr 2017. 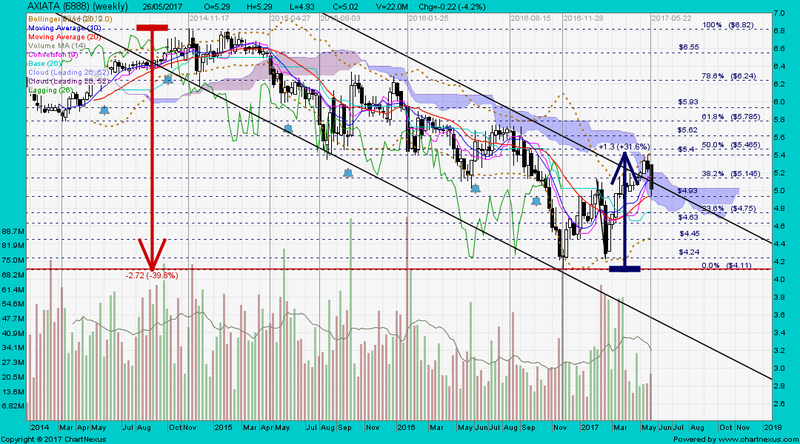 Immediate support @ S$0.60, immediate resistance @ S$0.65. 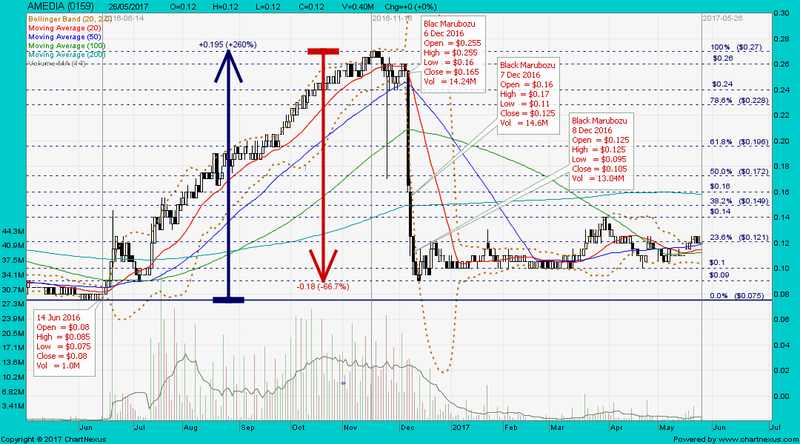 Japfa closed with a black marubozu @ S$0.97 (-0.03, -0.03%) with 2.24m shares done on 17 Feb 2017. 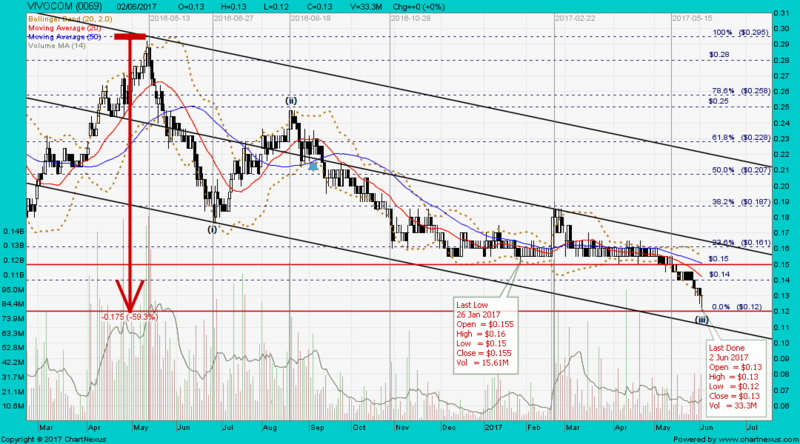 Immediate support @ S$0.95, immediate resistance @ S$1.015. Ekovest closed @ RM1.19 (+0.02, +1.7%) with 119,342,700 shares done on 5 May 2017. 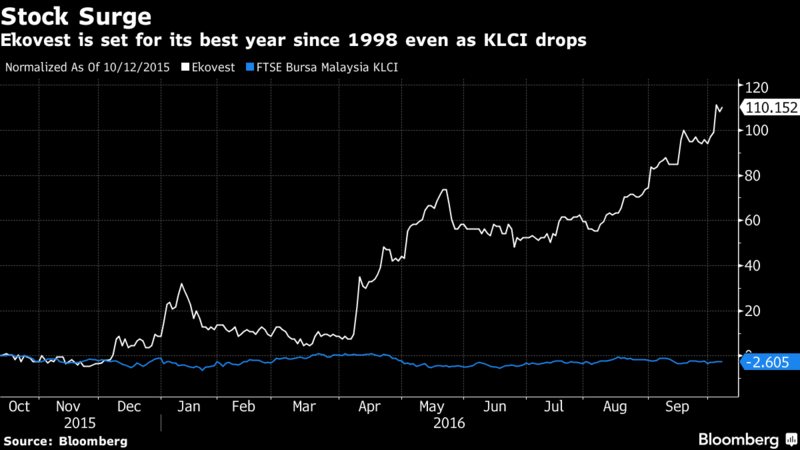 Shares of Ekovest have risen about 93% this year, bucking the 1.6% decline in the benchmark FTSE Bursa Malaysia KLCI Index over the same period. 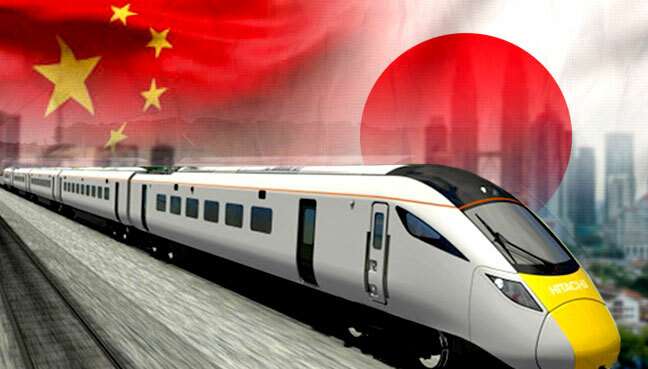 In the wake of a possible fallout between the Chinese and Malaysian governments over the Bandar Malaysia property deal lapsing, Japan is increasing its push to get a lucrative tender for a high-speed rail (HSR) link between Kuala Lumpur and Singapore. 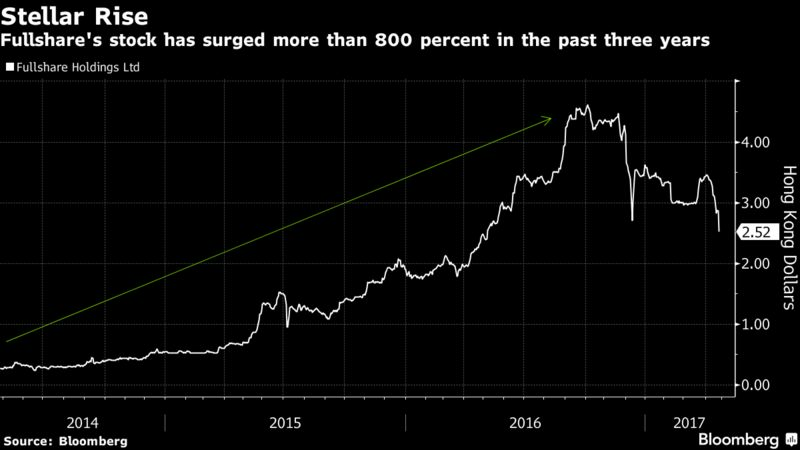 According to Fitch, total debt reached 258% of China’s GDP last year, a ratio it expects will grow this year and next. Beijing needs to keep interest rates at relatively low levels to not cause companies to default on their mounting debts. 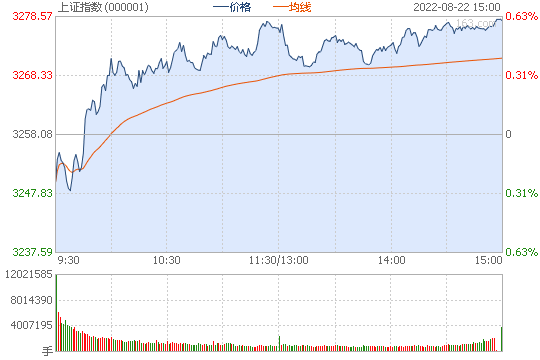 The Shanghai Composite fell below its 200dma, for the first time since the end of September 2016. 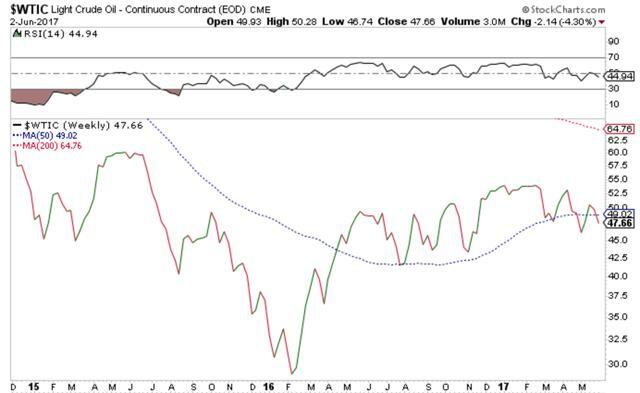 A new uptrend in the index started during mid-2014, but only successfully made it above the 200dma during October of that year. 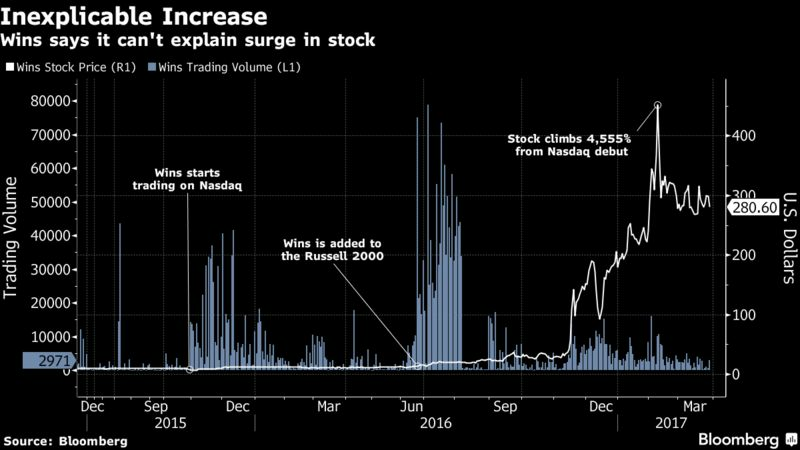 Since then the index has soared, up 120% from 2,300 to 5,200 over the course of just 11 months, from July 2014 to June 2015. At that point it fell. From the time it crossed below the 200dma on September 2015 at 3,600, it dropped 1,000 points in just four months, through January 2016. 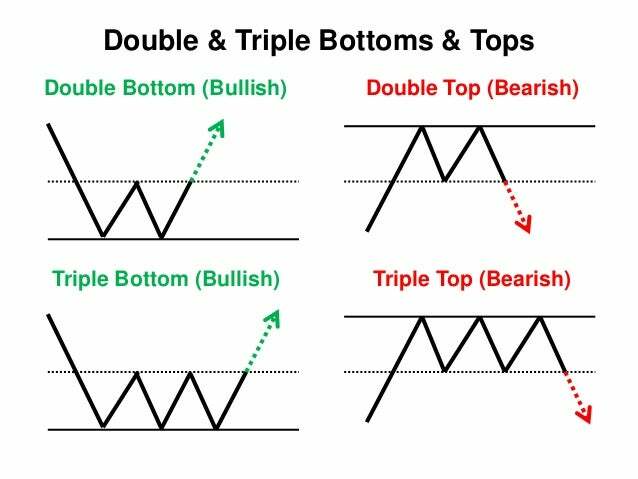 Finally, at the beginning of October 2016 it crossed back above the 200dma and climbed 8% to 3,300 in just two months, through the end of November. 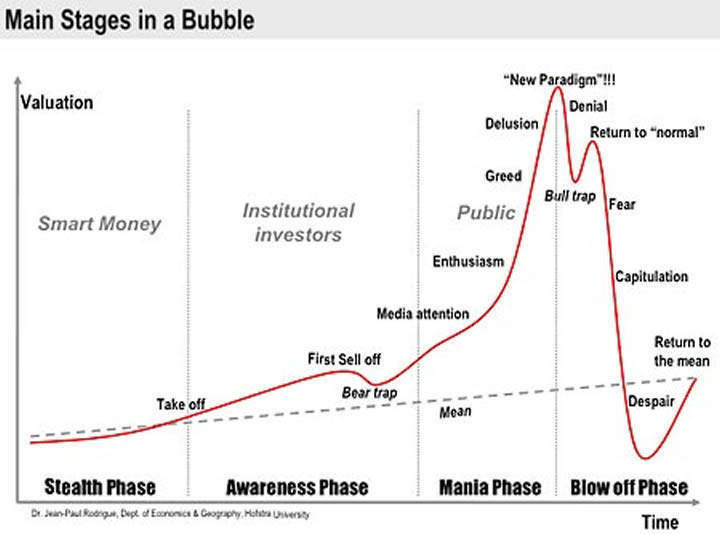 Now it has crossed below again, for the first time since October. 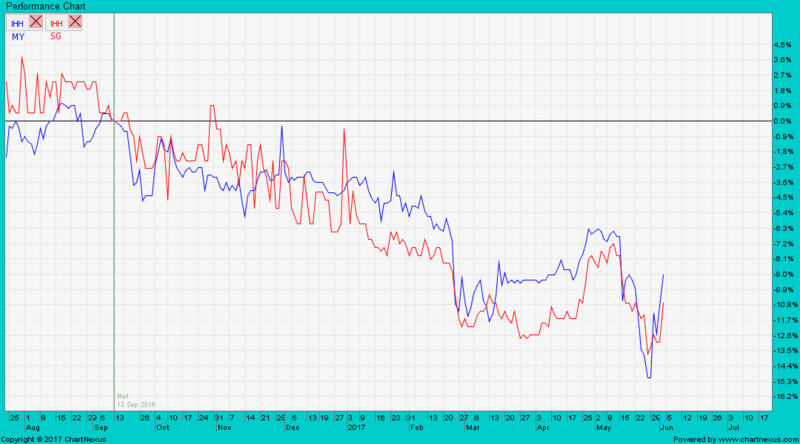 It would appear the fluctuations are accelerating. 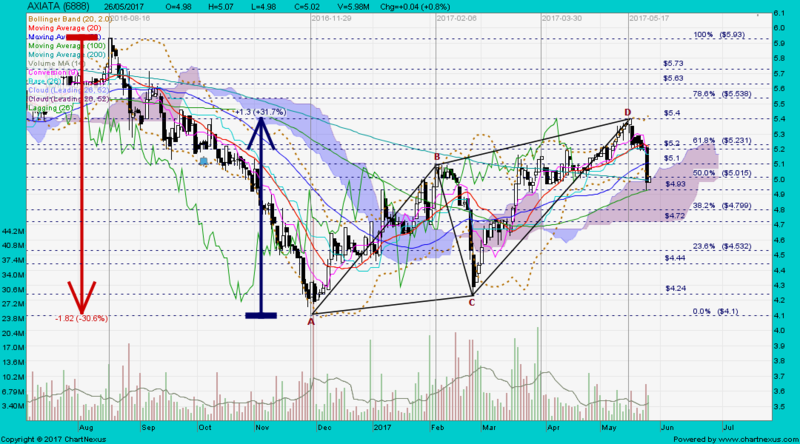 However, on April 27, the index formed a hammer, a bullish candlestick. 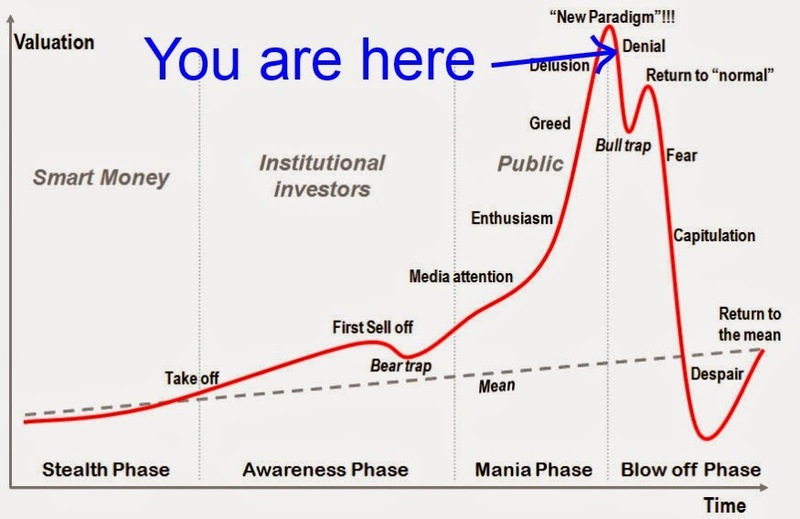 Since then, it has been holding support. 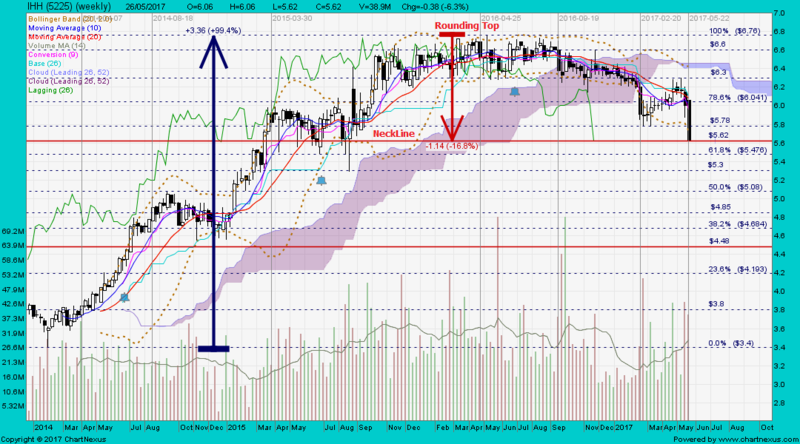 Only a decisive close below 3,100 would signal a further decline. 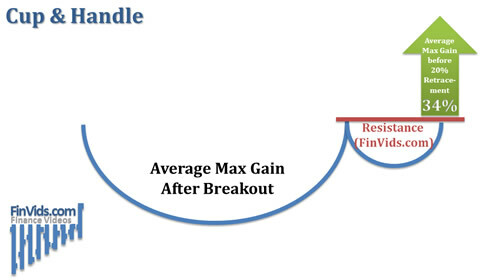 The Moving Average is the average price of an asset over a certain period of time. 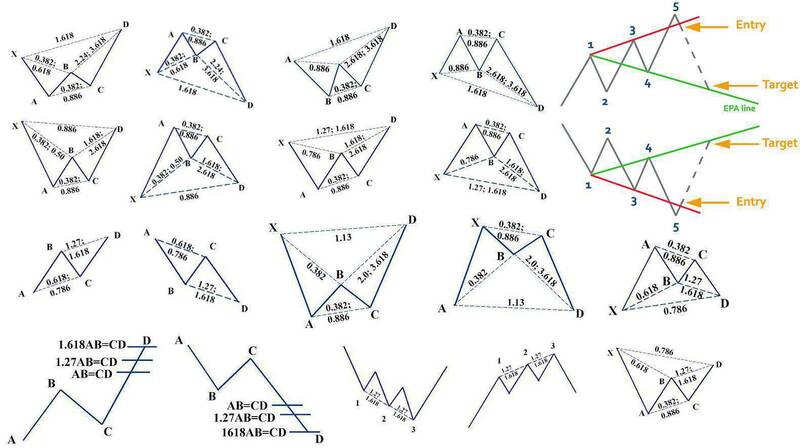 It is calculated by adding up the closing prices over a certain number of time periods, and then dividing by that number of time periods. 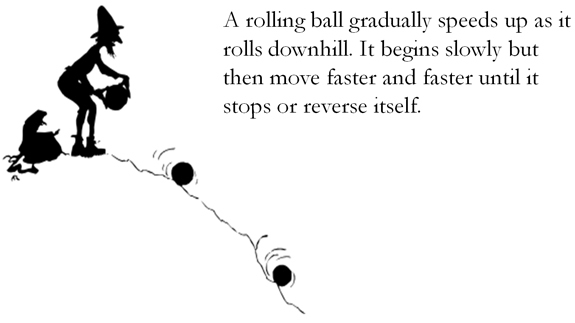 MA’s are used to measure momentum. 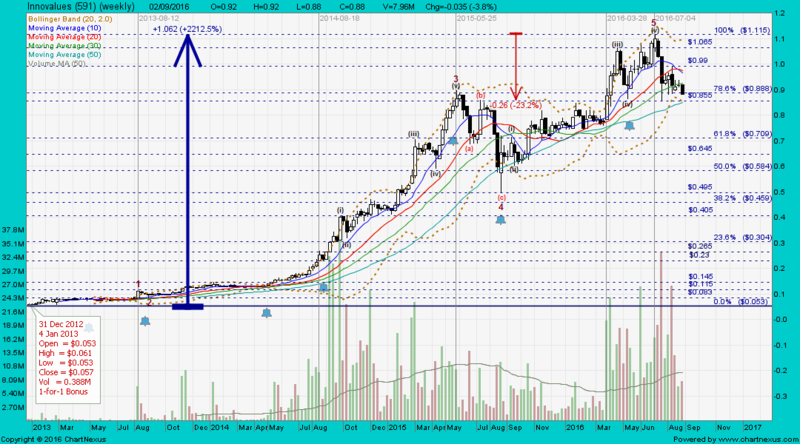 The most watched MA is the 200 day, it is widely recognized as the dividing line between bull and bear territory. 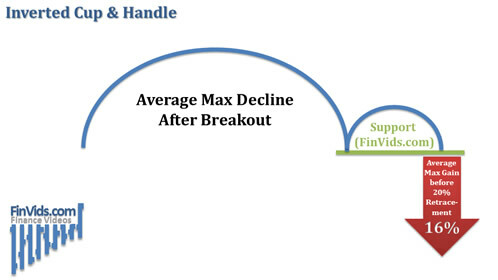 The primary trend is considered to be up as long as the market is trading above its 200-day moving average but this trend turns bearish whenever the market closes below this average. 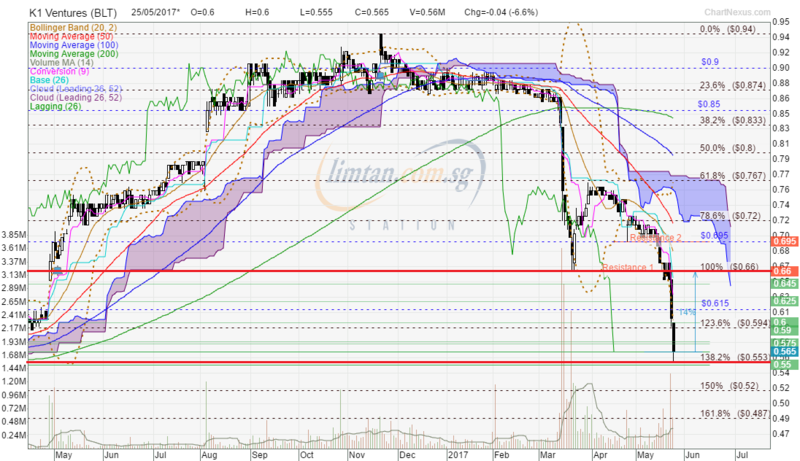 Shares of Iskandar Waterfront City Bhd’s (IWC) hit limit-down following the termination of the Bandar Malaysia deal. IWC plunged 92 sen, or 29.87% to RM2.16 in early trade on 8 May 2017. IWC closed with a bearish shooting star @ RM1.61 (-0.55, -25.46%) with extremely high volume done at 237,623,600 shares on 9 May 2017. Starhub closed with a black marubozu @ S$2.72 with 3.42m shares done on 9 May 2017. 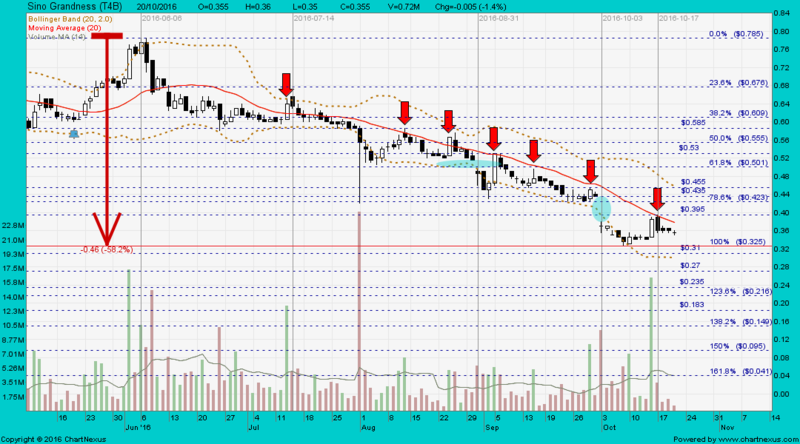 Immediate support @ S$2.68, immediate resistance @ S$2.76. 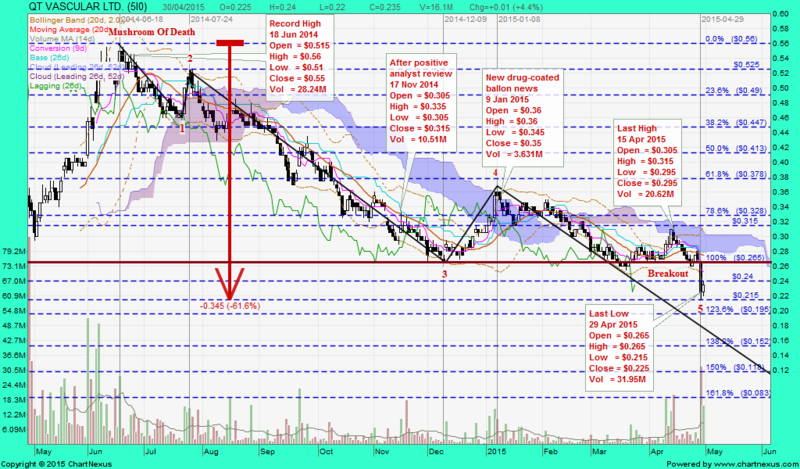 Starhub closed with a black marubozu @ S$3.31 (-0.02, -0.6%) with 3.46m shares done on 22 Jan 2016. 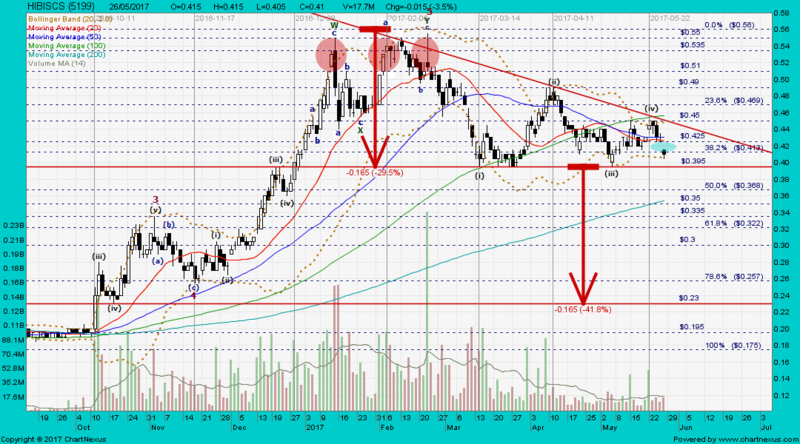 Immediate support @ S$3.27, immediate resistance @ S$3.37. SingTel closed with a spinning top @ S$3.77 (-0.05, -1.3%) with high volume done at 46.9m shares on 13 Apr 2017. 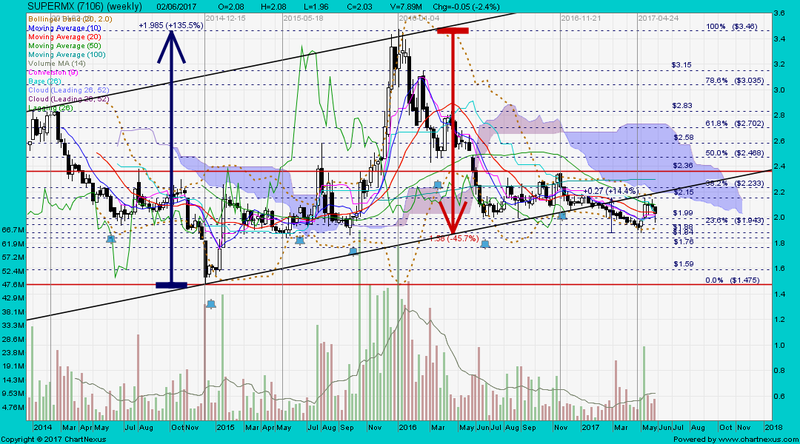 Immediate support @ S$3.70, immediate resistance @ S$3.81. SSE closed at 3061.5 (+8.72, +0.29%) on 11 May 2017. 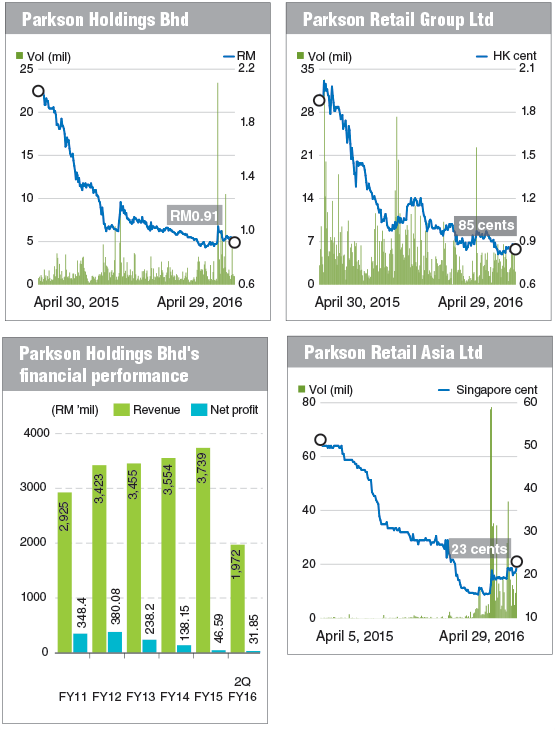 PARKSON closed with an inverted hammer unchanged @ RM0.64 with 810,000 shares done on 24 May 2017. 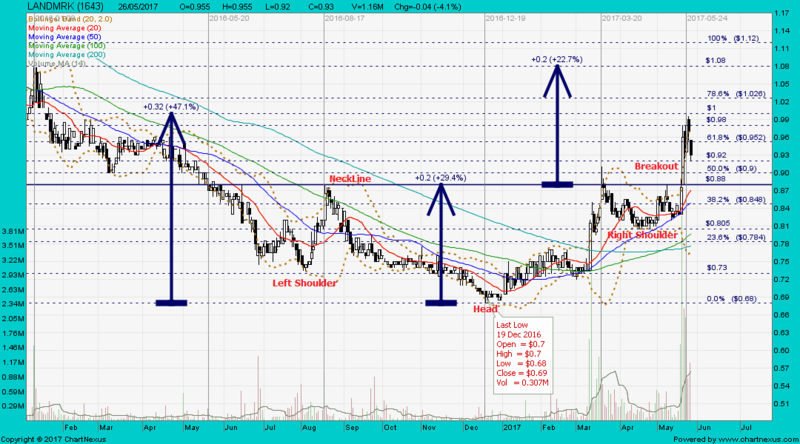 Immediate support @ RM0.615, immediate resistance @ RM0.65. 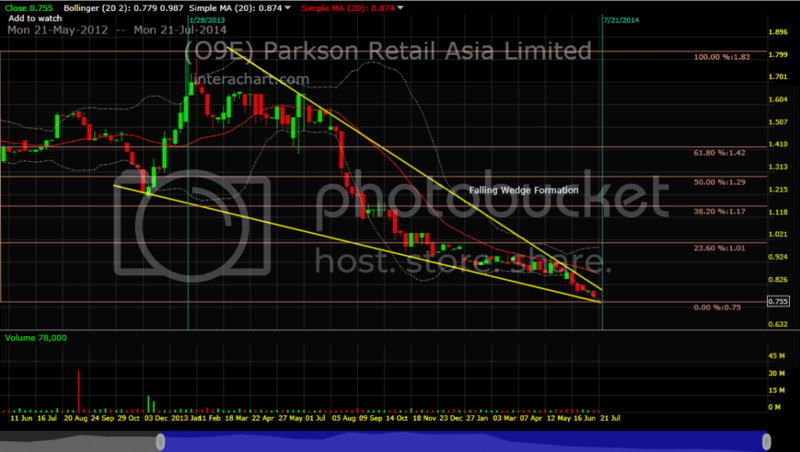 Parkson Retail Asia closed with a black marubozu @ S$0.091 (-0.005, -5.2%) with 2.34m shares done on 23 May 2017. K1 Ventures had a black marubozu and traded @ S$0.565 (-0.04, -6.6%) with 560,000 shares done on 25 May 2017 at 0950 hrs. K1 Ventures had a black marubozu and traded @ S$0.60 (-0.05, -7.7%) with 760,000 shares done on 24 May 2017 at 1530 hrs. 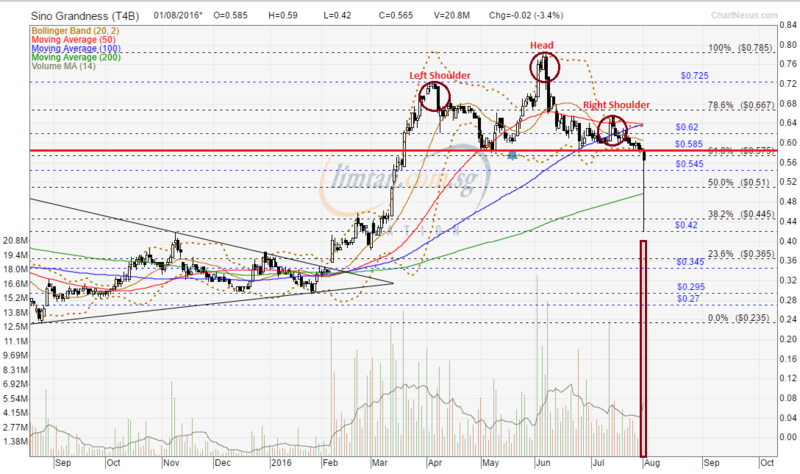 K1 Ventures closed with a bearish engulfing @ S$0.65 (-0.005, -0.6%) with 290,000 shares done on 23 May 2017. Singapore's Rowsley Ltd will convert its Iskandar project in Malaysia into a healthcare hub instead of a mixed-use township, amid a rising supply of homes in the special economic zone. 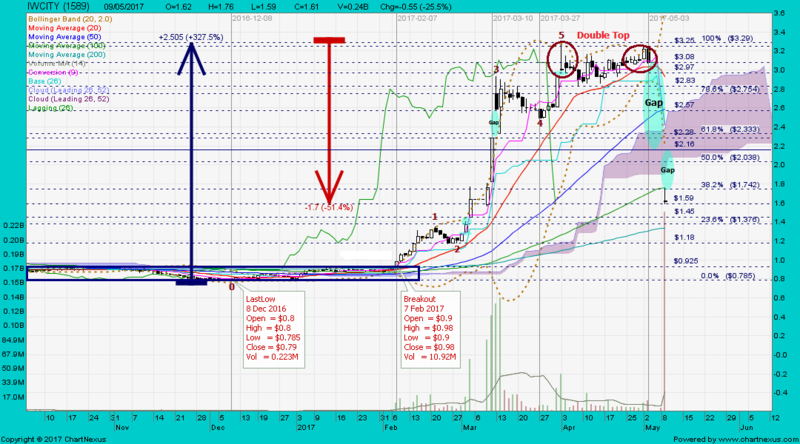 Rowsley closed with a dragonfly doji unchanged @ S$0.087 with 2.86m shares done on 24 May 2017. Sino Grandness closed with a gravestone doji @ S$0.225 (-0.005, -2.2%) with 740,000 shares done on 24 May 2017. 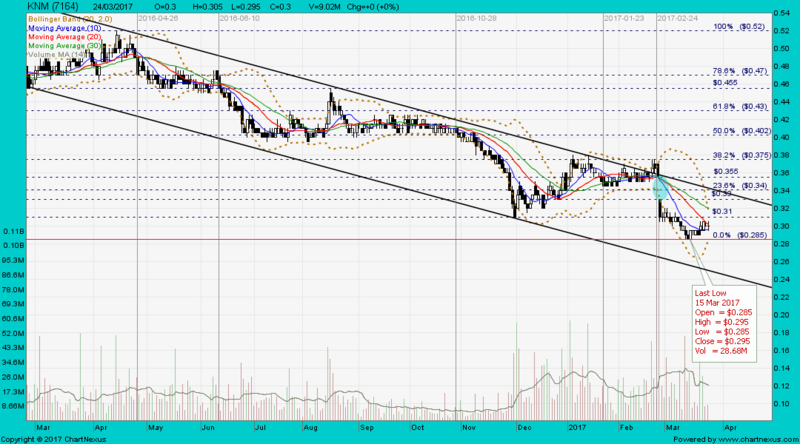 Immediate support @ S$0.22, immediate resistance @ S$0.235. 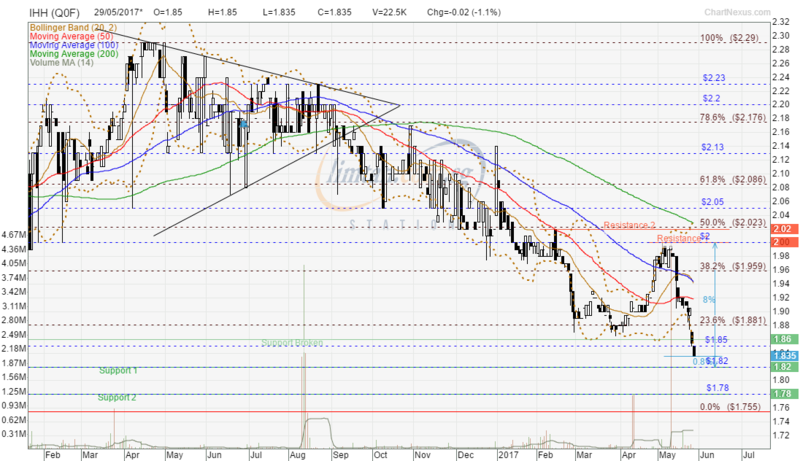 Luster closed with a hammer @ RM0.14 (-0.005, -3.4%) with 21.6m shares done on 25 May 2017. 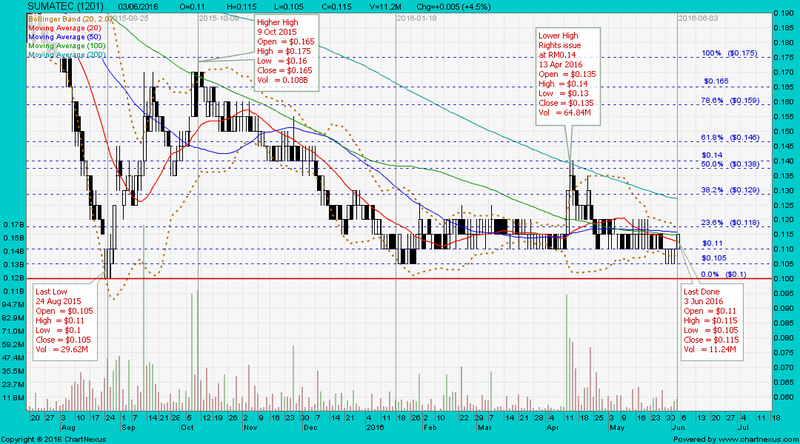 Immediate support @ RM0.13, immediate resistance @ RM0.15. 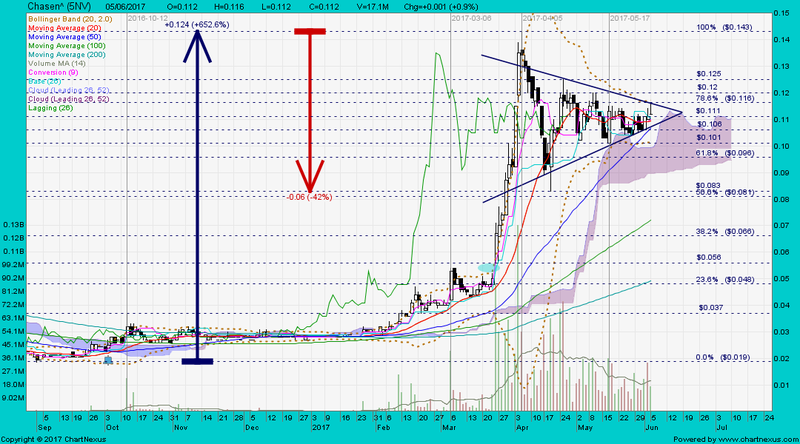 Hibiscus gapped down and closed with a hanging man @ RM0.41 (-0.015, -3.5%) with 17.7m shares done on 26 May 2017. 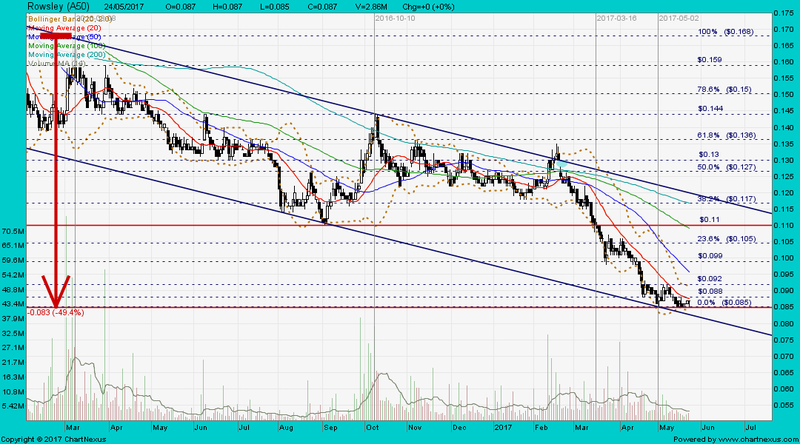 Immediate support @ RM0.395, immediate resistance @ RM0.415. The 23 new Shariah-compliant securities included Aemulus Holdings Bhd, Amtel Holdings Bhd, Ann Joo Resources Bhd, Asia Media Group Bhd, Cabnet Holdings Bhd, Can-One Bhd, Daiman Development Bhd, Eversafe Rubber Bhd, Foundpac Group Bhd, GFM Services Bhd, Hibiscus Petroleum Bhd, HLT Global Bhd, Imaspro Corp Bhd, Leweko Resources Bhd, MUI Properties Bhd, Pan Malaysia Holdings Bhd, Perdana Petroleum Bhd, Seal Incorporated Bhd, Stone Master Corp Bhd, Sunway Construction Group Bhd, Vsolar Group Bhd and Yinson Holdings Bhd. 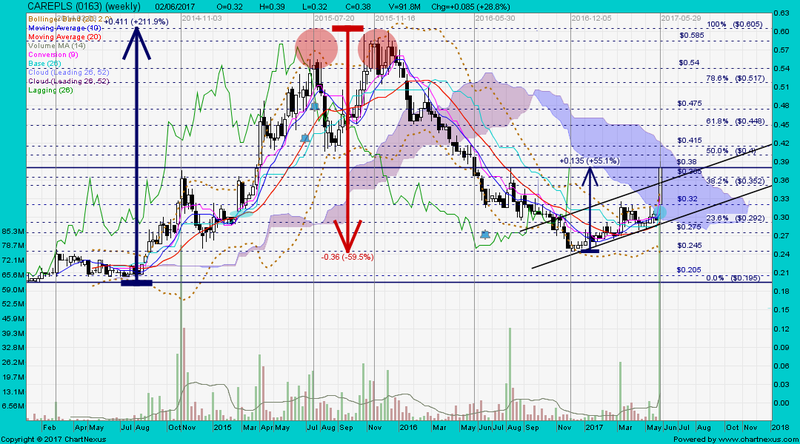 AMEDIA closed with a four-price doji unchanged @ RM0.12 with 398,000 shares done on 26 May 2017. IHH closed with a black marubozu @ RM5.62 (-0.09, -1.6%) with 8.06m shares done on 26 May 2017. 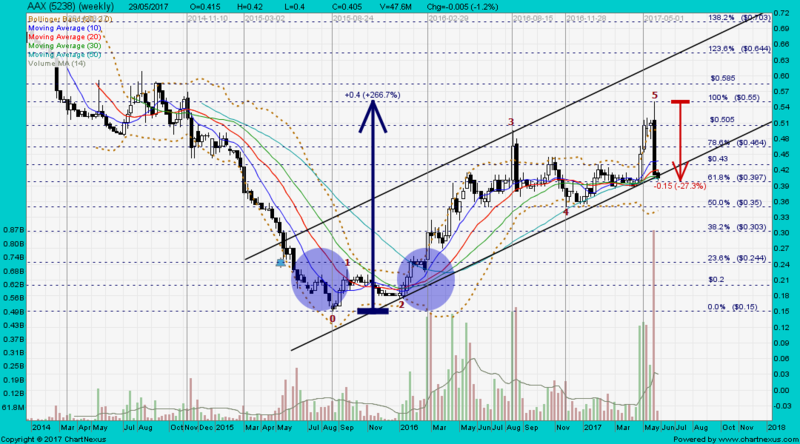 Immediate support @ RM5.55, immediate resistance @ RM5.71. 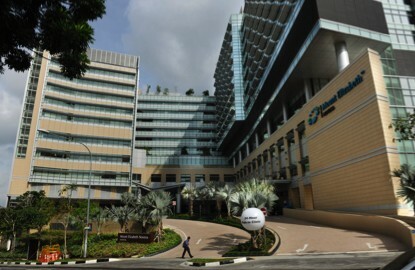 However, RHB Research believed that there would be an impact on the group’s quarterly earnings in the first half of the year stemming from start-up losses from Gleneagles HK, which began operations in March 2017. 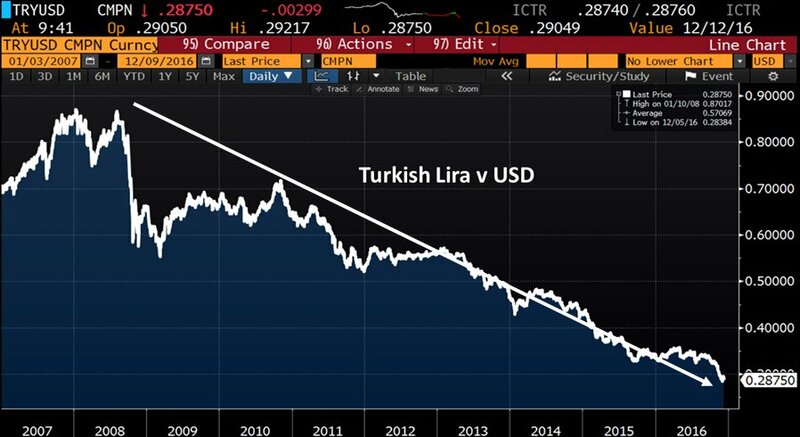 IHH that has a substantial interest in Turkey wants to reduce its risk in the country due to the currency volatility of the lira against the US dollar and the spiralling medical inflation there. IHH Healthcare Bhd (IHH) saw its net profit in the first quarter (Q1) ended March 31, 2017 double to RM470 million, from RM235.5 million in the previous corresponding quarter, following a RM313.4 million gain from its divestment of a non-core 6.07% stake in Apollo Hospitals. IHH Q0F.SI had a black marubozu and traded @ S$1.835 (-0.02, -1.1%) with 22,500 shares done on 29 May 2017 at 0925 hrs. 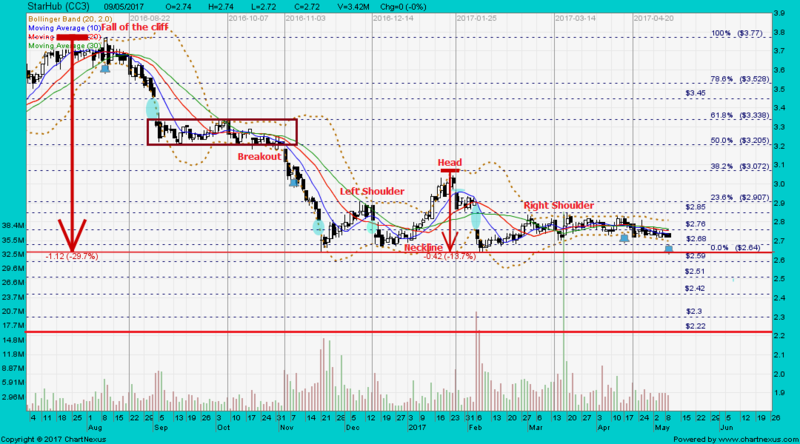 Immediate support @ S$1.82, immediate resistance @ S$1.88. 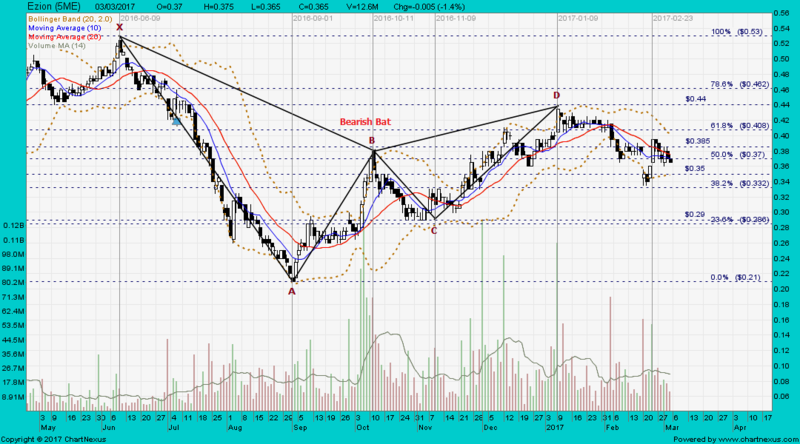 IHH Q0F.SI closed with an inverted hammer @ S$2.15 (-0.05, -2.3%) with 23,300 shares done on 5 Sep 2016 at 1325 hrs. Axiata's first-quarter net profit slumped 35% from a year earlier, due mainly to higher depreciation and amortization charges, coupled with higher finance costs and share of losses from associates. Axiata closed with a white marubozu @ RM5.02 (+0.04, +0.8%) with 5.98m shares done on 26 May 2017. 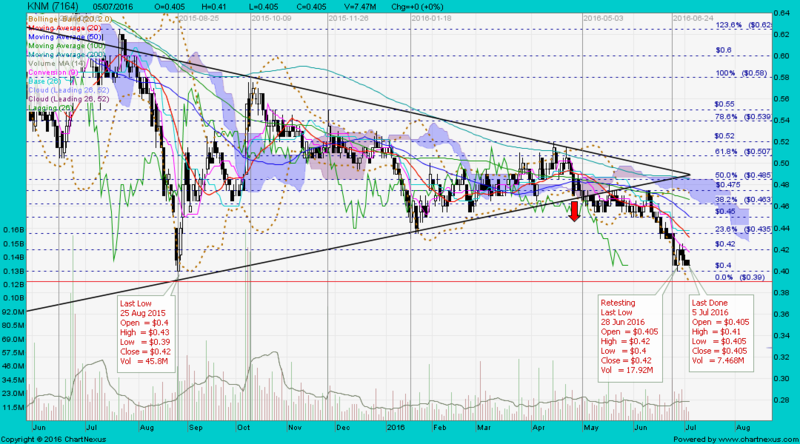 Immediate support @ RM4.80, immediate resistance @ RM 5.10. 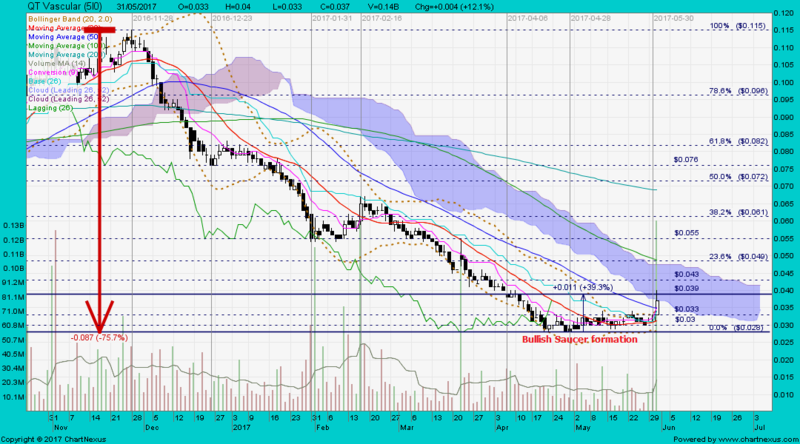 Landmark closed with a black marubozu @ RM0.93 (-0.04, -4.1%) with 1.16m shares done on 26 May 2017. 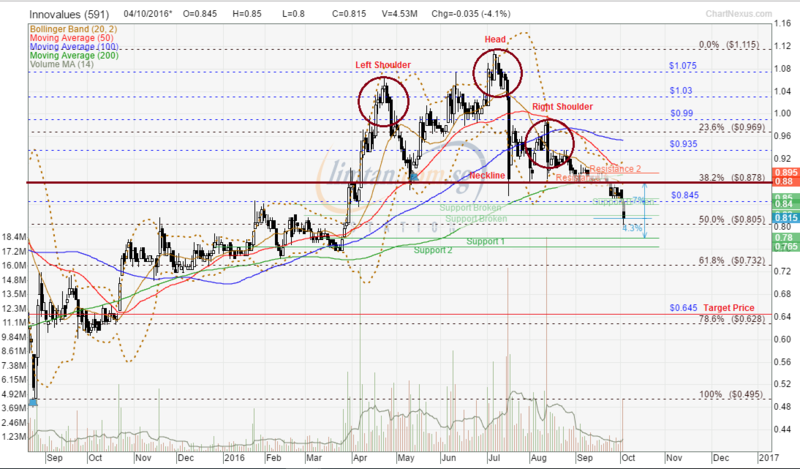 Immediate support @ RM0.90, immediate resistance @ RM0.95. "Cheng Kay run road liao..."
RHB on Wednesday says it is time for shareholders of k1 Ventures to take some money off the table. 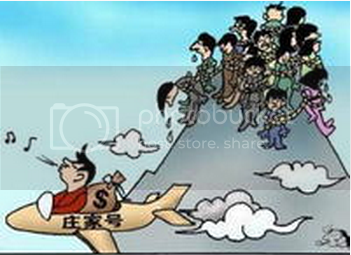 This comes after k1 recently announced plans to divest its interests in US-based education company Knowledge Universe Education (KUE) and privately-held global financial services firm Guggenheim Capital. “If the proposed sales are successful, k1 intends to distribute proceeds back to shareholders and will effectively become a shell company,” says RHB analyst Goh Han Peng. According to Goh, Guggenheim Capital has grown its assets under management significantly since k1 first invested in 2011. 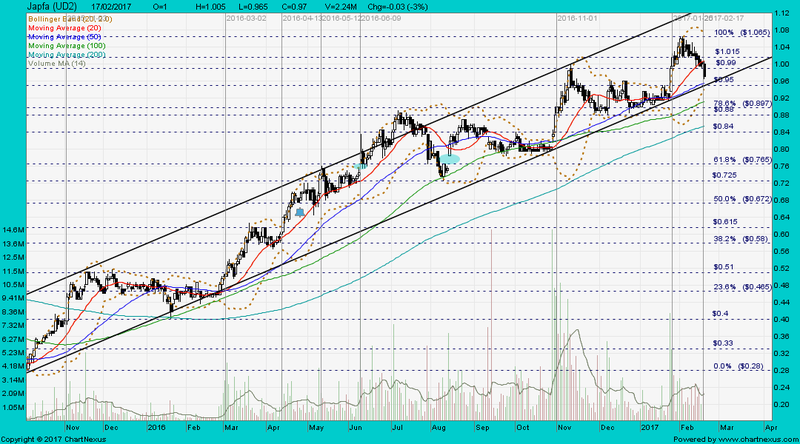 Its AUM has more than doubled around US$240 billion currently. 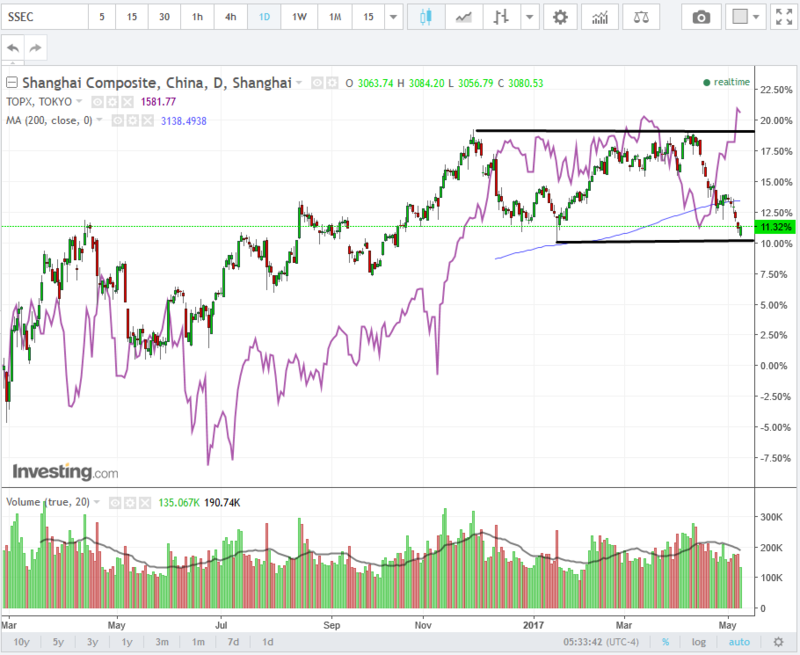 While the sale of stake in Guggenheim Capital is expected to fetch a handsome premium over its book value, Goh notes that k1 is already currently trading at a 70% premium over its book value of 48 cents per share. 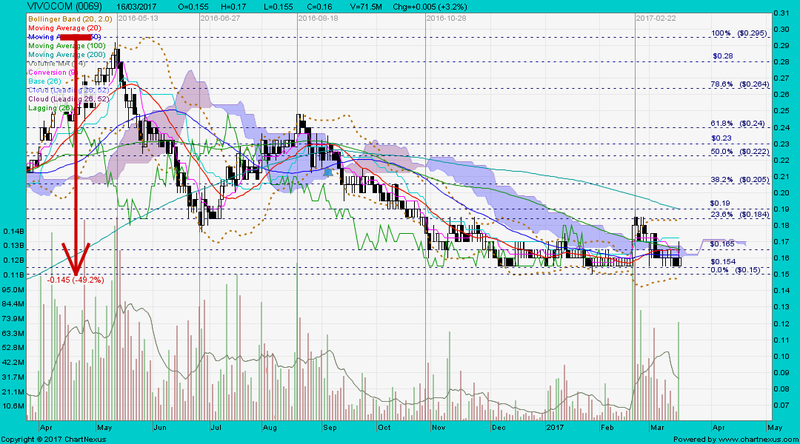 As at 11.22am, shares of k1 Ventures are trading 6 cents lower at 77.5 cents. AirAsia X Bhd continued to register a sharp fall in its net profit with a slump of 94.2% to RM10.34 million for the first quarter ended March 31, 2017 against RM179.49 million in the same quarter a year ago, dragged down by higher fuel expenses. AAX closed with a hammer @ RM0.405 (-0.005, -1.2%) with 47.6m shares done on 29 May 2017. 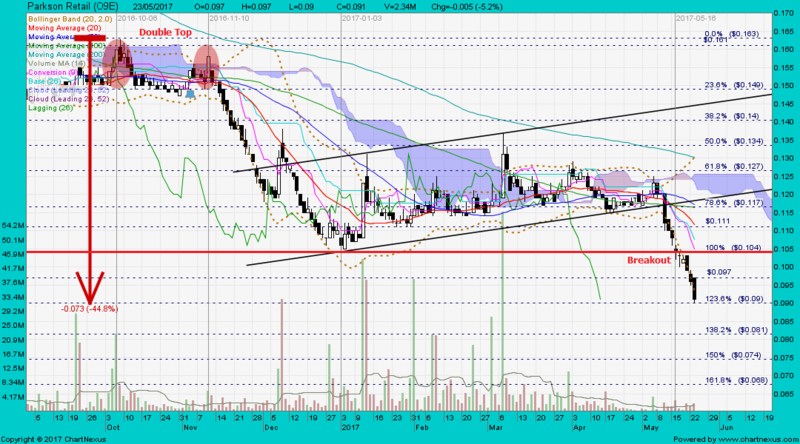 Immediate support @ RM0.39, immediate resistance @ RM0.41. 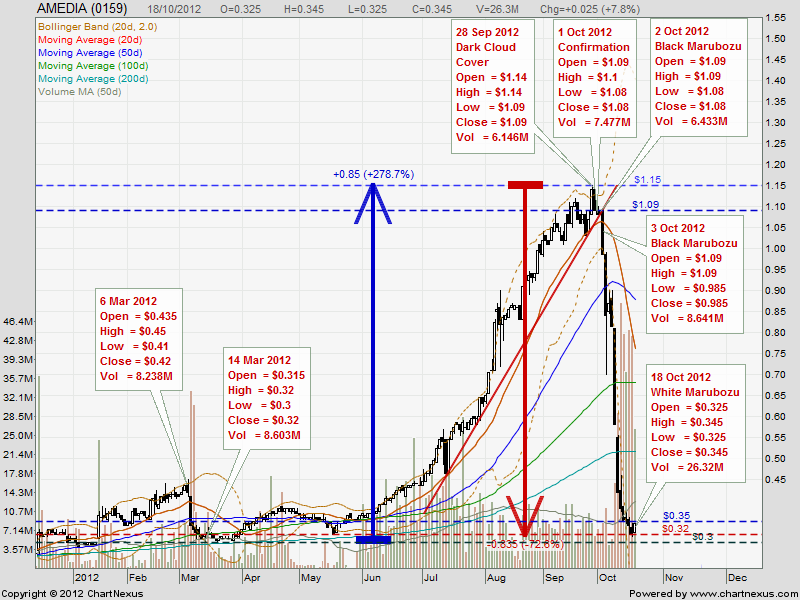 QT Vascular closed with an inverted hammer @ S$0.037 (+0.004, +12.1%) with 135,339,400 shares done on 31 May 2017. 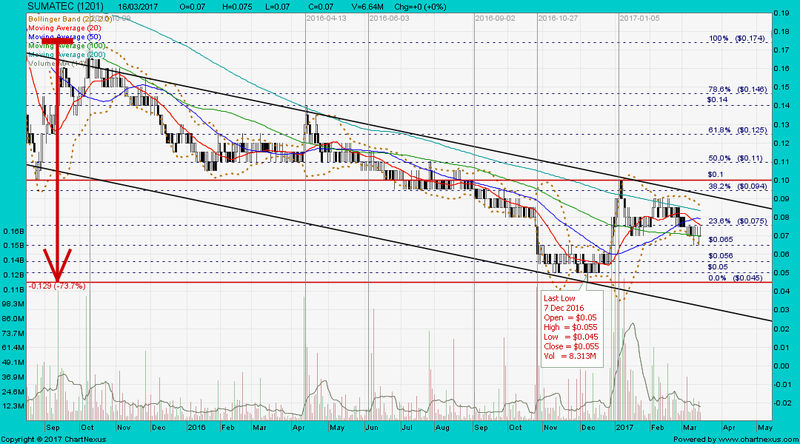 Immediate support @ S$0.03, immediate resistance @ S$0.043. 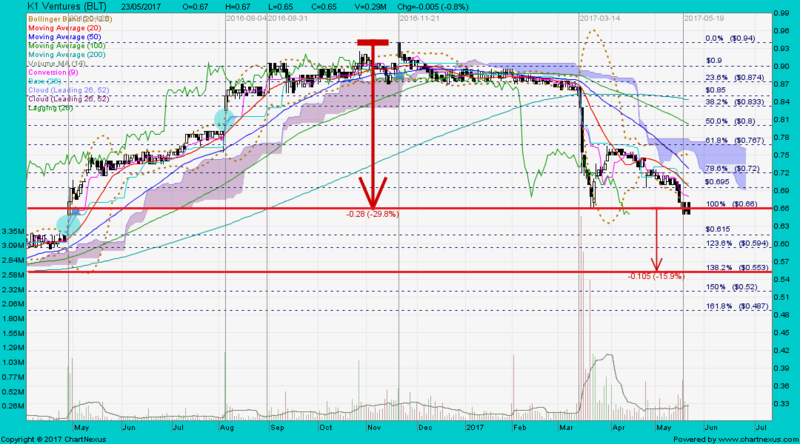 QT Vascular peaked at high of S$0.56 on 18 Jun 2014 and collapsed (-95%) to last low of S$0.028 on 20 Apr 2017. 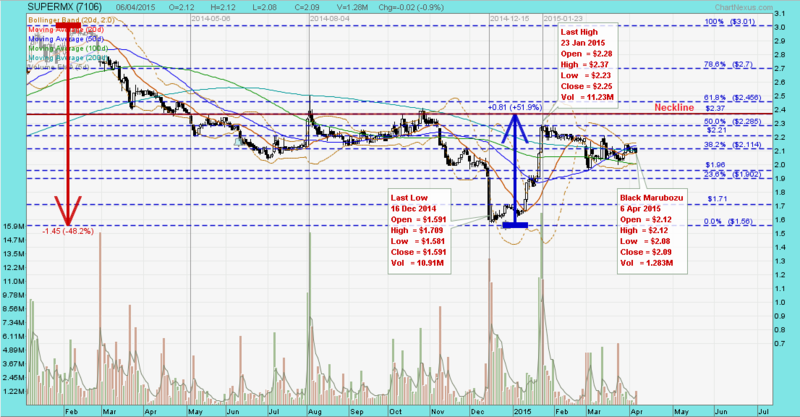 QT Vascular closed with a spinning top @ S$0.235 (+0.01, +4.4%) with 16.1m shares done on 30 Apr 2015. 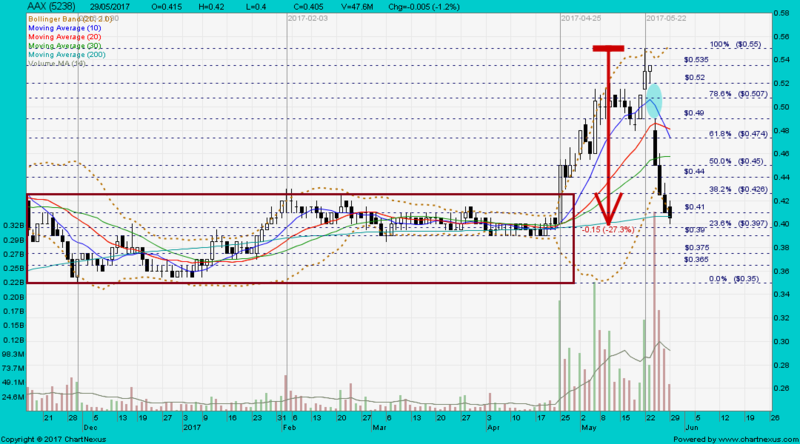 Vivocom closed with a dragonfly doji unchanged @ RM 0135 with 4.32m shares done on 31 May 2017. 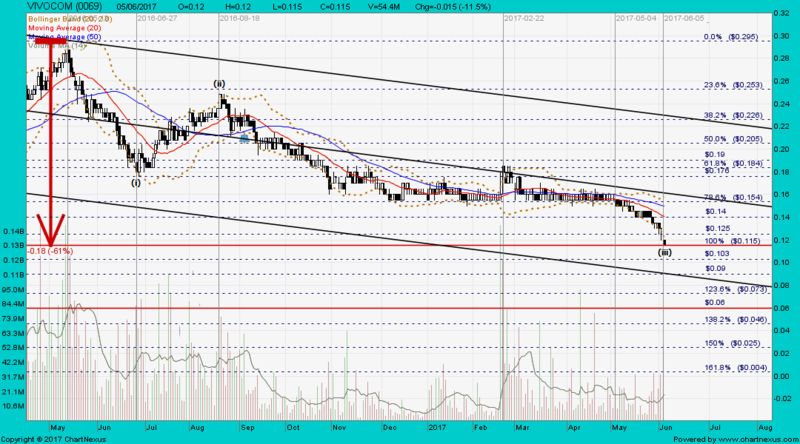 Immediate support @ RM0.13, immediate resistance @ RN0.14. SUPERMX closed with a hammer @ RM2.03 (+0.02, +1%) with 910,000 shares done on 2 Jun 2017. 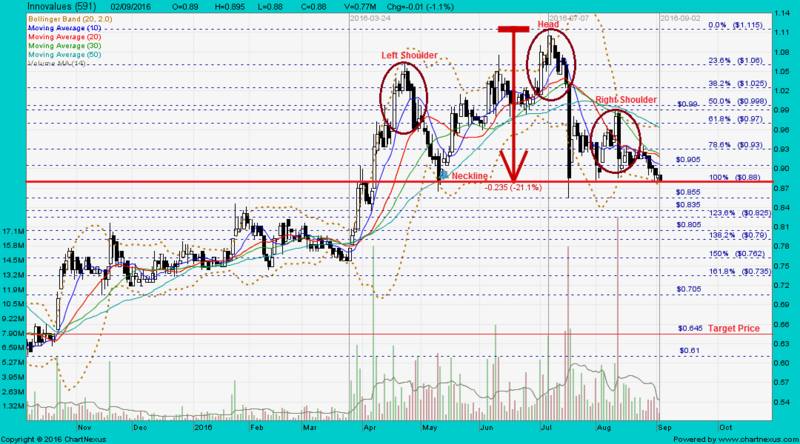 Immediate support @ RM1.96, immediate resistance @ RM2.05. 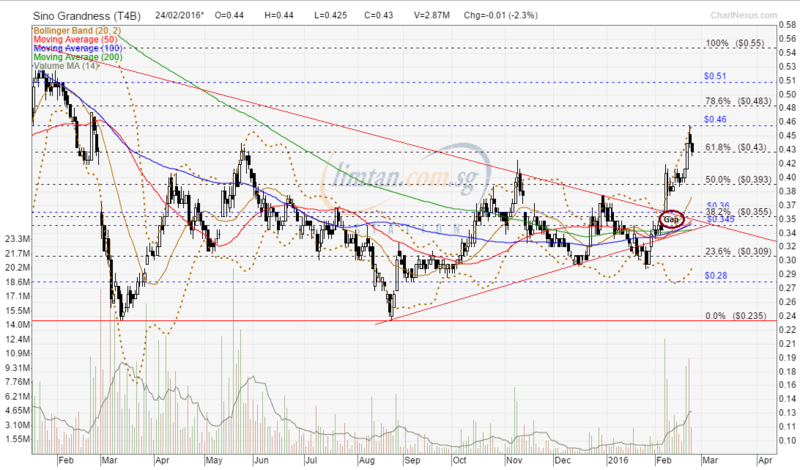 SUPERMX closed with a black marubozu @ RM2.09 (-0.02, -0.9%) with 1.28m shares done on 6 Apr 2015. 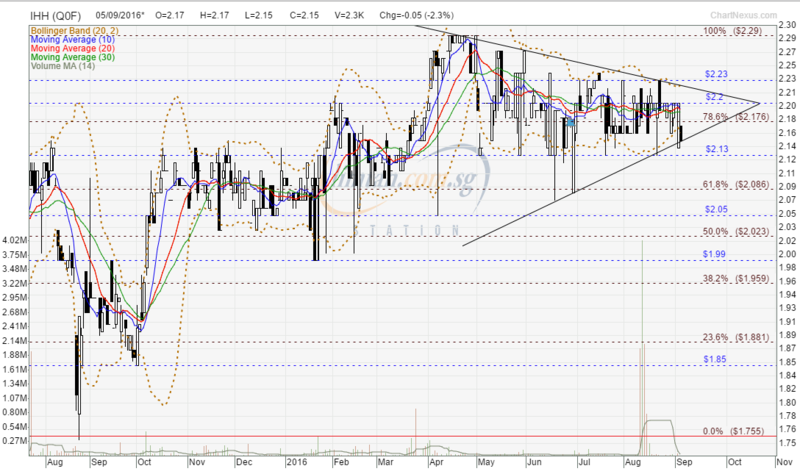 Immediate support @ RM1.96, immediate resistance @ RM2.21. 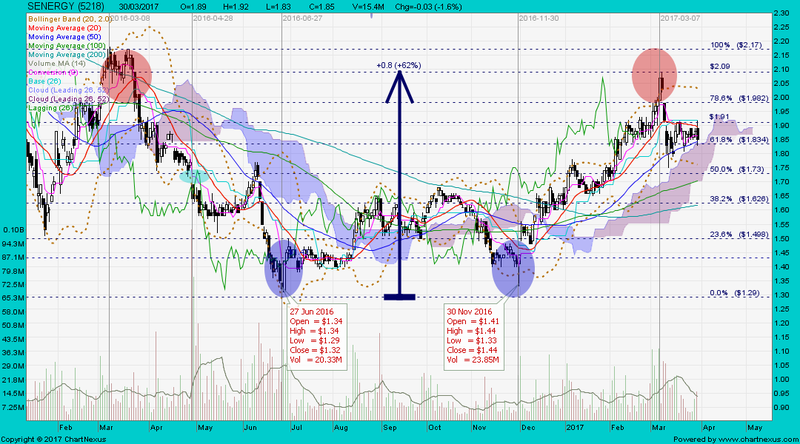 IHH Q0F.SI closed with a white marubozu @ S$1.92 (+0.05, +2.7%) with 67,100 shares done on 2 Jun 2017. 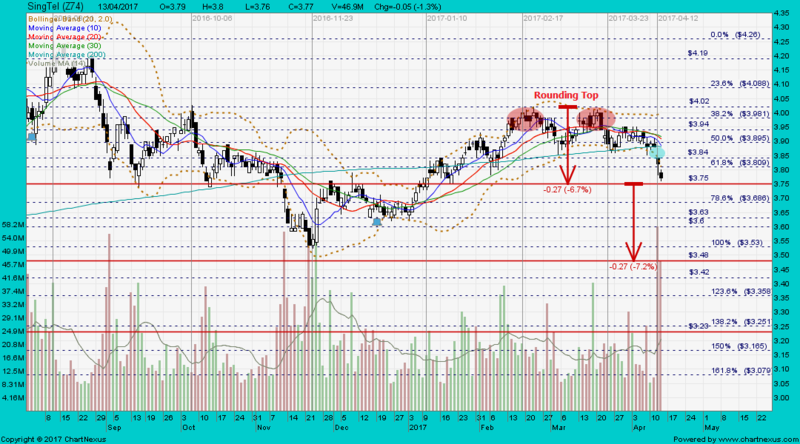 Immediate support @ S$1.91, immediate resistance @ S$1.945. 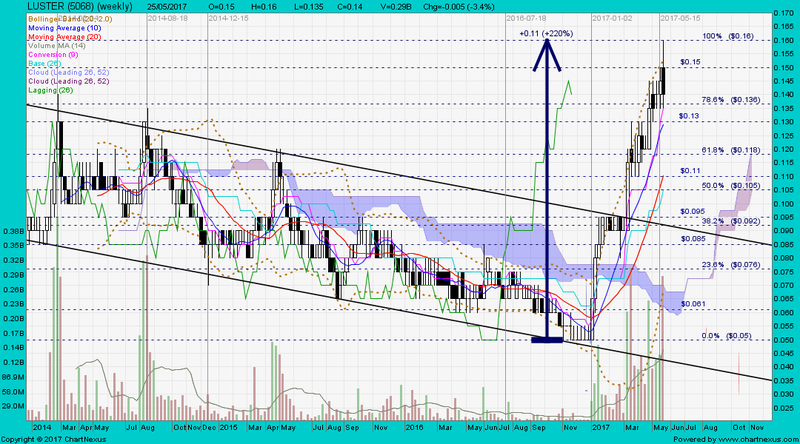 Ezion closed with a doji @ S$0.26 (+0.005, +2%) with 8.64m shares done on 2 Jun 2017. 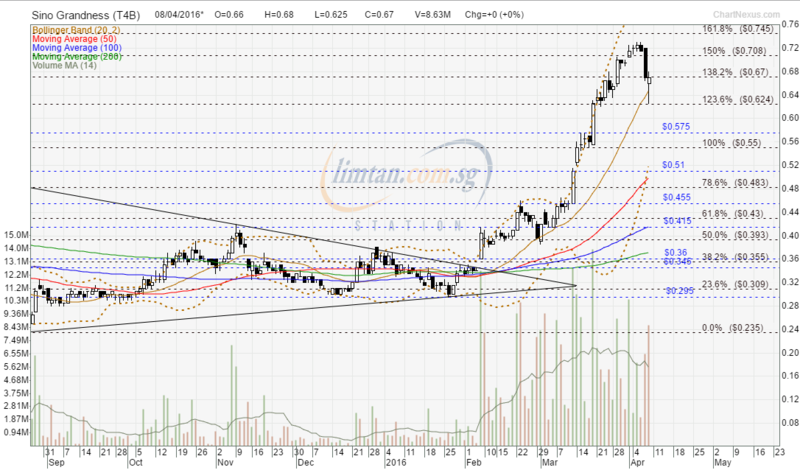 Immediate support @ S$0.245, immediate resistance @ S$0.265. 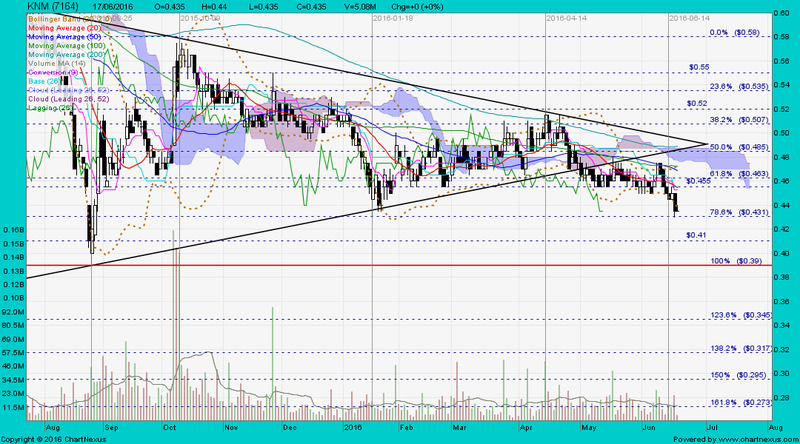 Immediate support @ S$0.35, immediate resistance @ S$0.37. WTI oil closed @ US$47.66 on 2 Jun 2017. K1 Ventures closed with a harami cross @ S$0.645 (+0.005, +0.8%) with 180,000 shares done on 2 Jun 2017. CAREPLUS closed with a spinning top @ RM0.38 (+0.005, +1.3%) with 11.5m shares done on 2 Jun 2017. 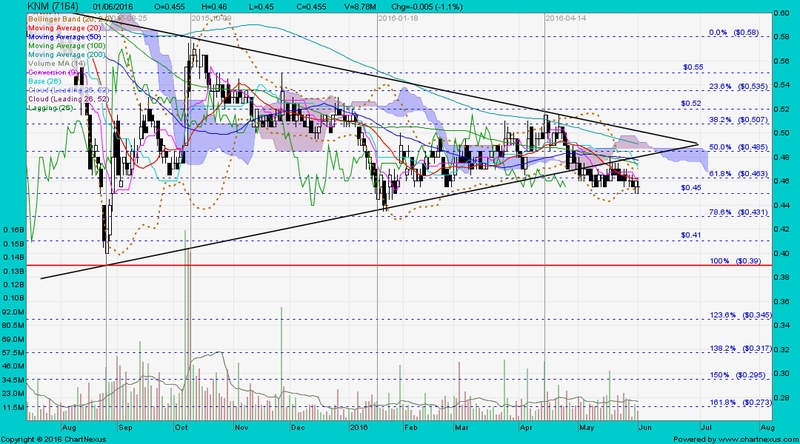 Immediate support RM0.365, immediate resistance $0.395. 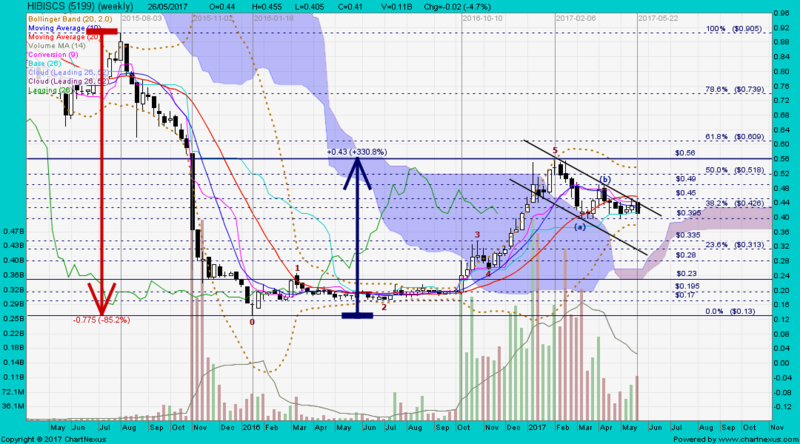 Vivocom closed with a dragonfly doji unchanged @ RM0.13 with 33.3m shares done on 2 Jun 2017. 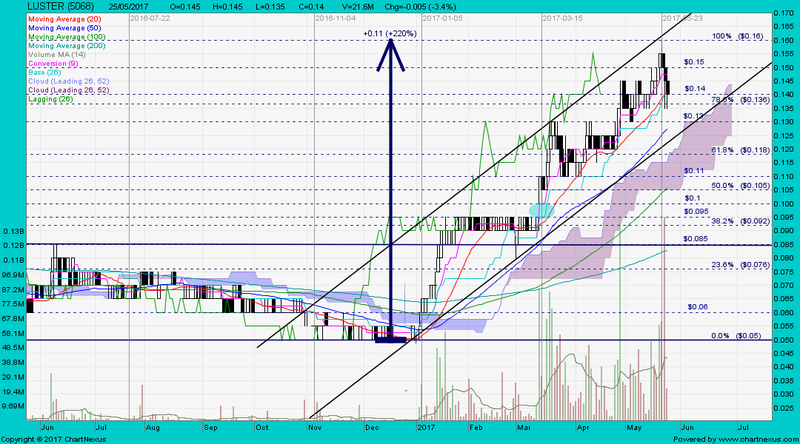 Immediate support @ RM0.12, immediate resistance @ RN0.14. Vivocom closed with a black marubozu @ RM0.115 (-0.015, -11.5%) with 54.4m shares done on 5 Jun 2017. 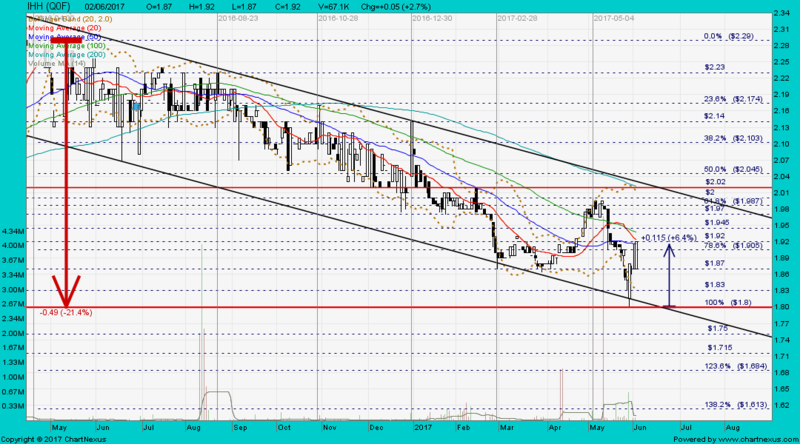 Immediate support @ RM0.103, immediate resistance @ RN0.125. 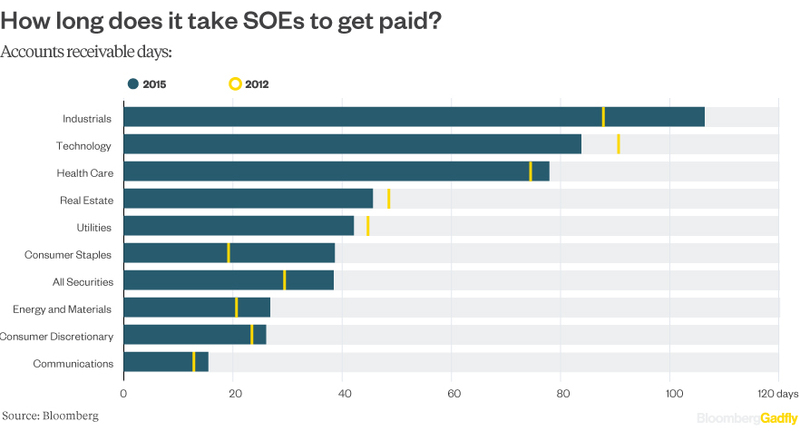 Three years after President Xi Jinping vowed to shake up state-owned enterprises, they're looking worse than ever. Chasen closed with a gravestone doji @ S$0.112 (+0.001, +0.9%) with 17.1m shares done on 5 Jun 2017. 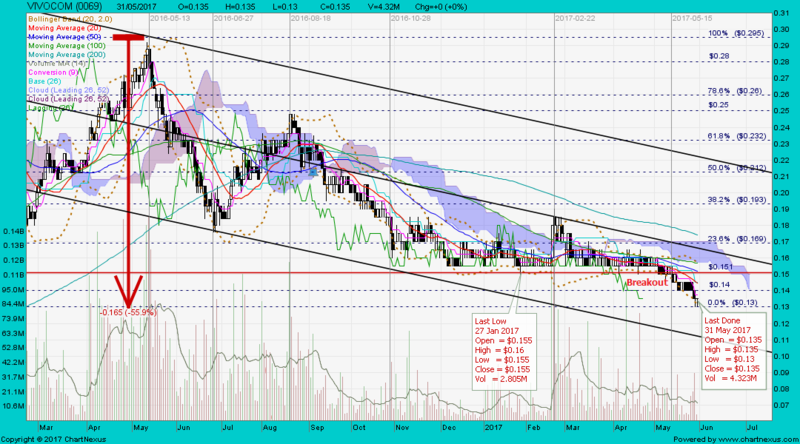 Immediate support @ S$0.106, immediate resistance @ S$0.116.